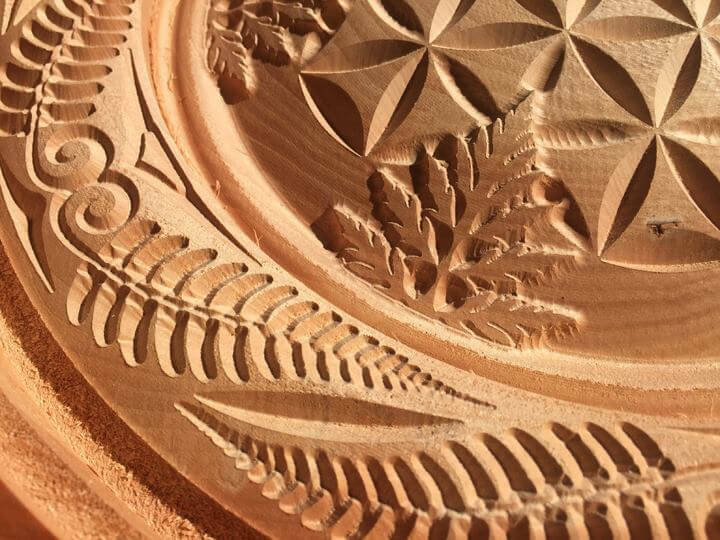 Carved elements can bring life and richness to interior spaces, and a timeless warmth that isn't achieved by other means. Tables, trim, doors, staircases, newel posts - there are plenty of opportunities to incorporate art into the functional aspects of a space. We are open to working to achieve your unique vision! 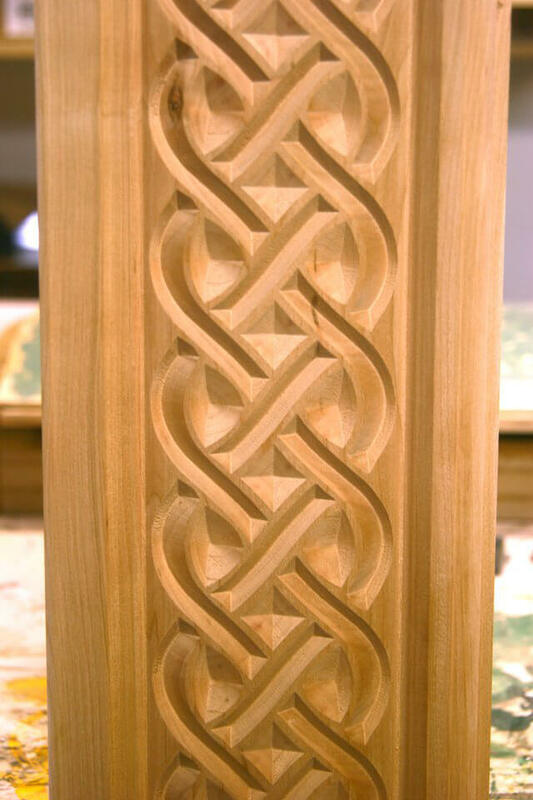 This carved element was produced in poplar and walnut. The points in the leaf correspond with a symbol known as the enneagram. This type of work can breath life and interest into a space. 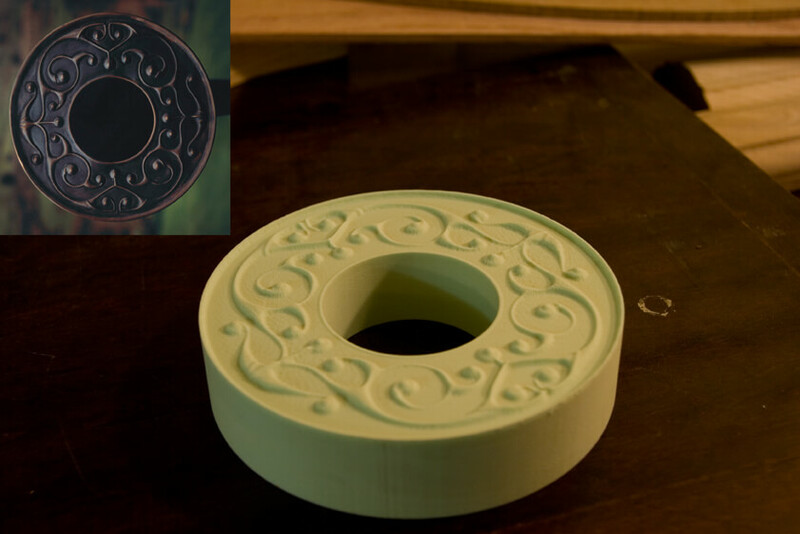 3D machining is truly amazing! 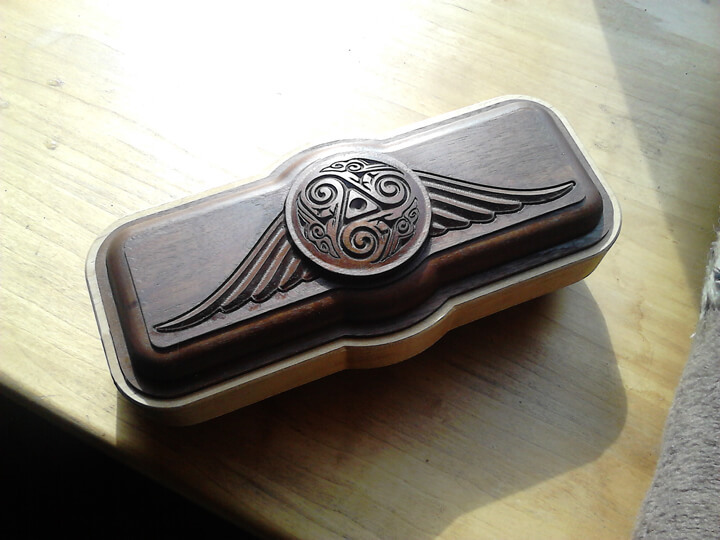 Three hand-drawn ravens in a celtic triskele symbol led to this carved box with a walnut lid. 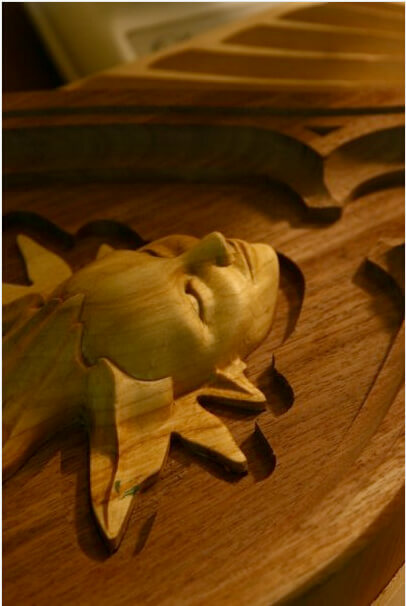 A close up look at the detail of the deep carvings in a live-edge table. 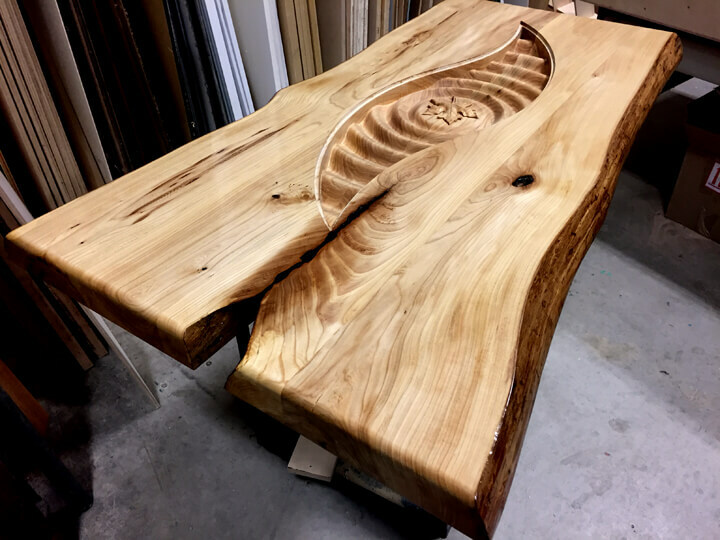 This custom live-edge table combines old symbolism with flora and fauna found on the Niagara Escarpment. 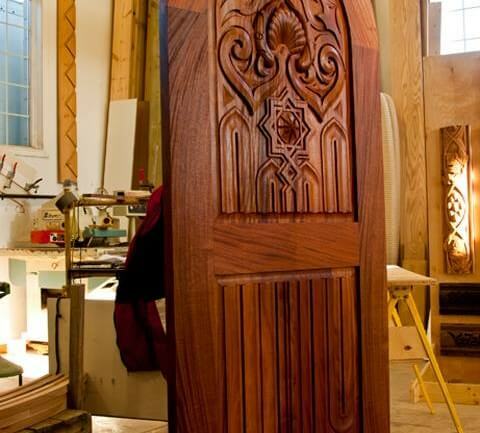 It is carved in elm, a hard, long-grained wood that would be daunting by conventional carving methods. The finished table sports glass set flush into the surface and legs of light ash wood. 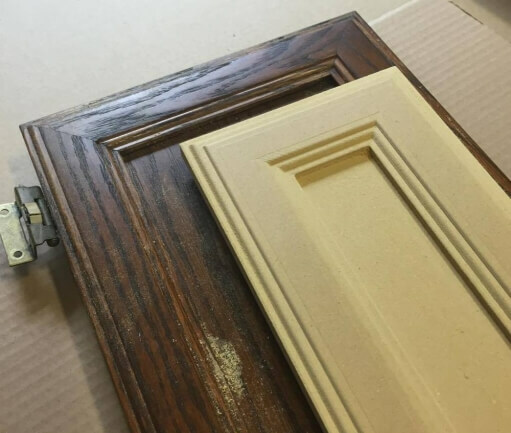 An exterior door panel in its rough form. 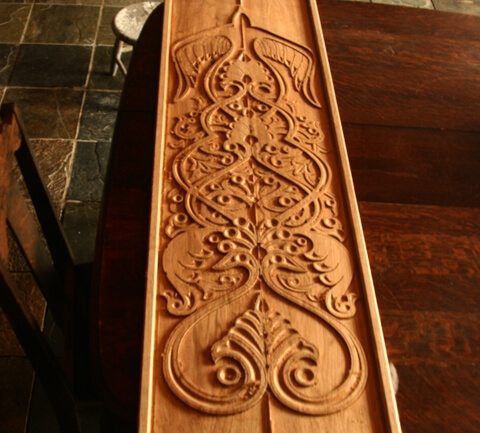 This carved door design was based on elements seen in the Alhambra. 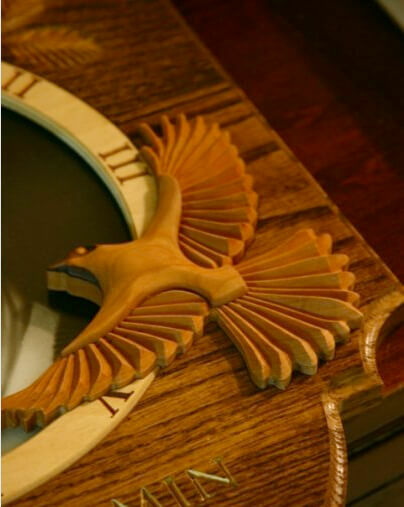 It was produced in African Mahogany. An image of the complete door, which was exhibited at the Index Design Show in Dubai. This symbolic art piece began as a set of pencil drawings. 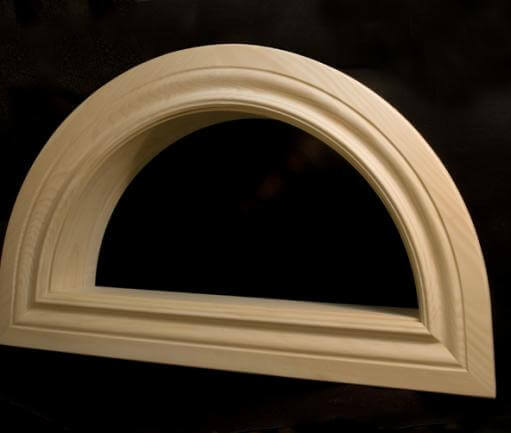 At 4 inches thick it exemplifies the degree to which full dimensional carving can be accomplished using three-axis equipment. 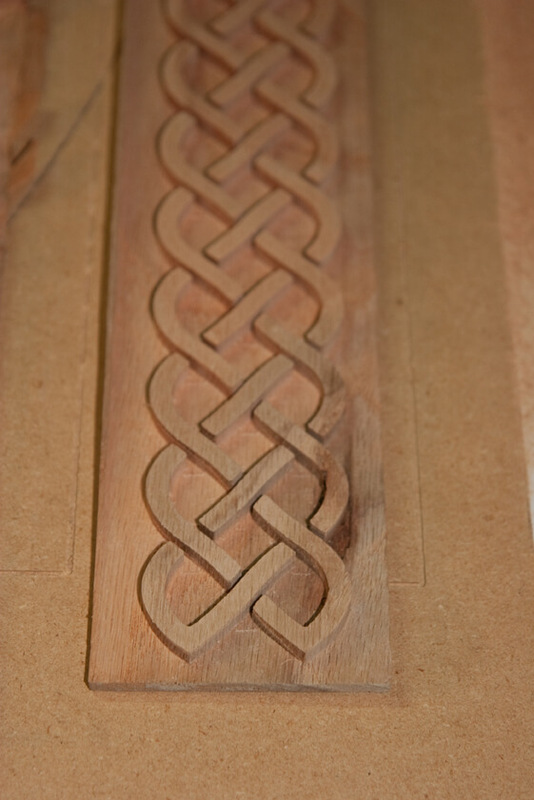 This closeup shows the level of detail achieved prior to hand carving. 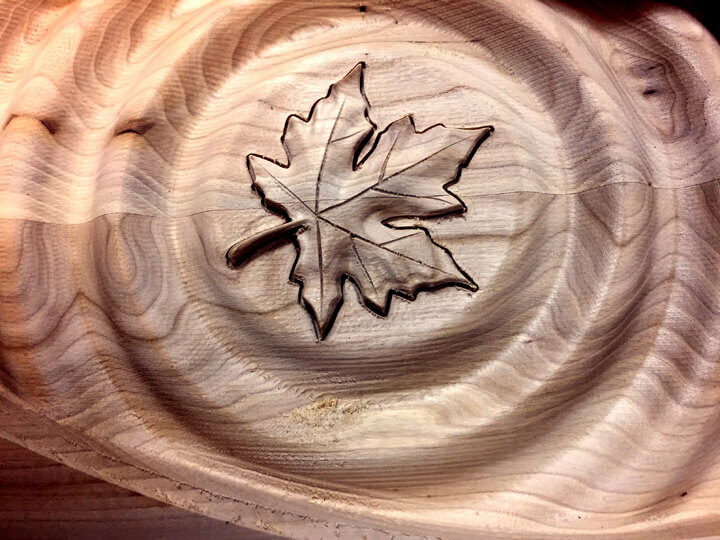 This leaf was carved into a thick elm slab. It maintains a lovely detail despite the wild grain of the tree. 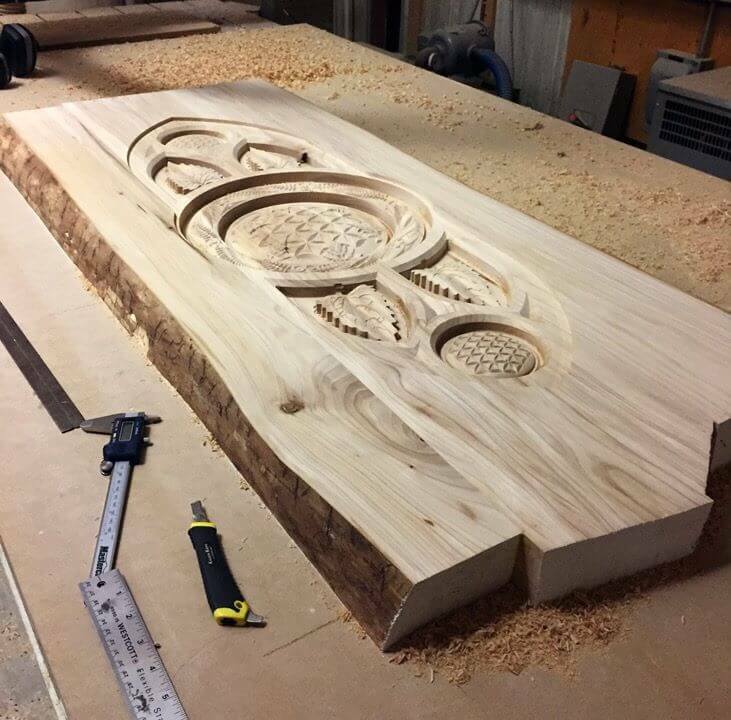 This carved elm slab will become a coffee table top with inset glass flush to the surface. 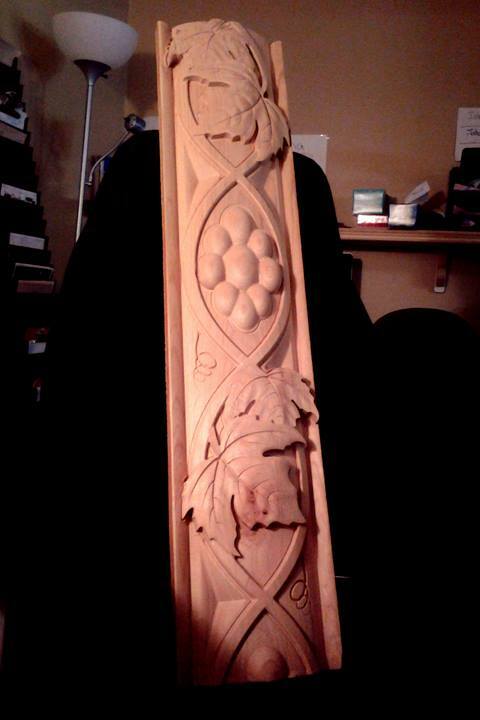 This test piece shows a grape vine motif that was carved in walnut and incorporated into a large wine cabinet. 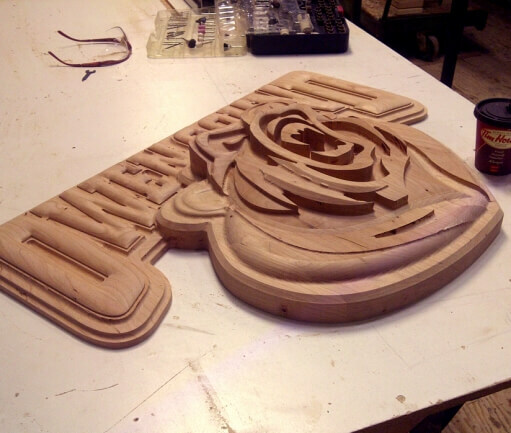 The logo from this hockey team was re-created in 3d and machined out of solid cherry wood. 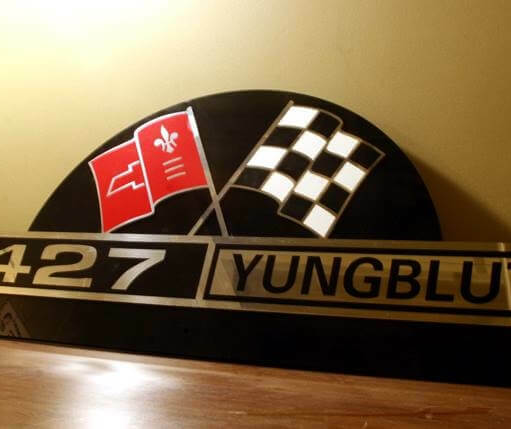 A portion of a commemorative mirror for a home installation. This commissioned three-dimensional mirror project incorporated a variety of symbolic elements. 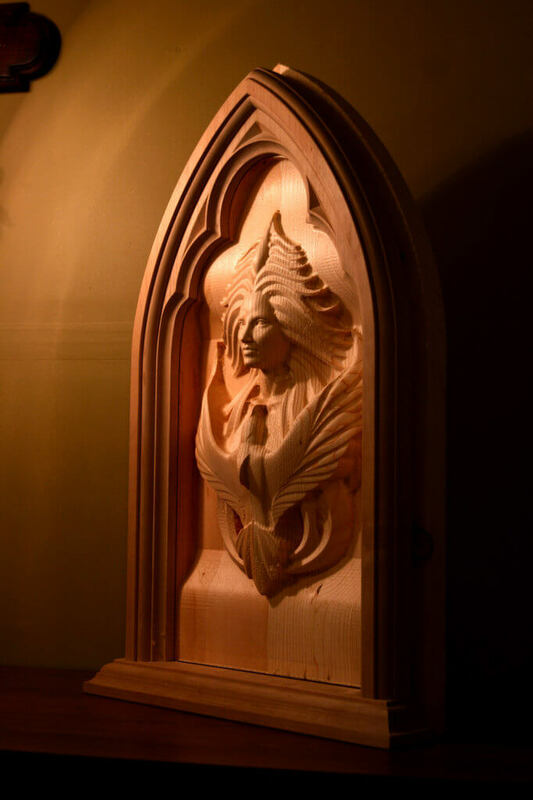 The inlay and wing were created out of poplar. 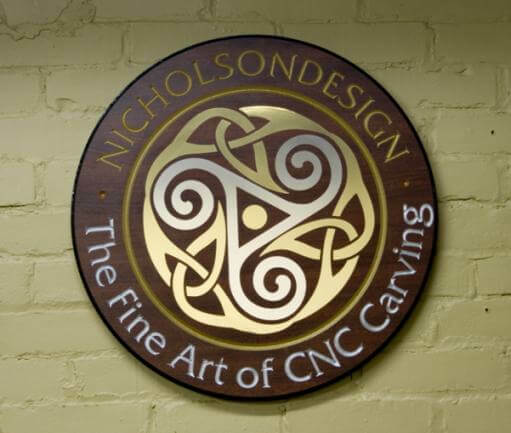 CNC machining enables us to create intricate artistic designs for your home or office. 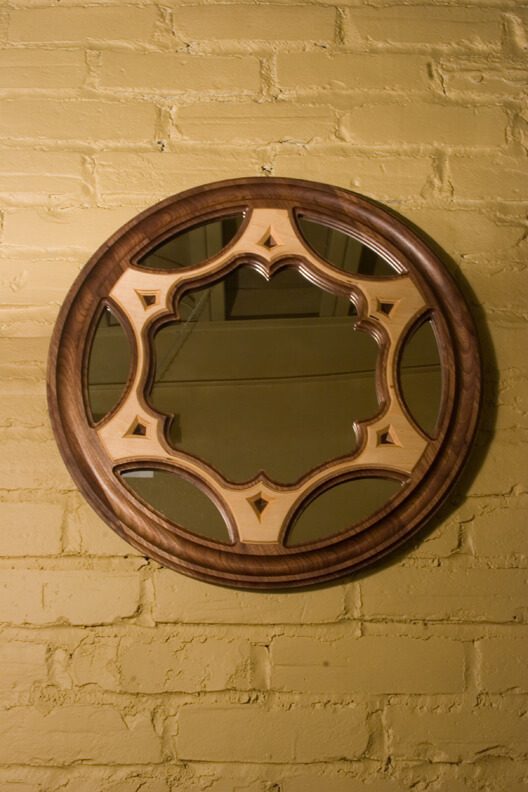 The brushed metal was inlayed into a walnut background of this mirror for a residential project. 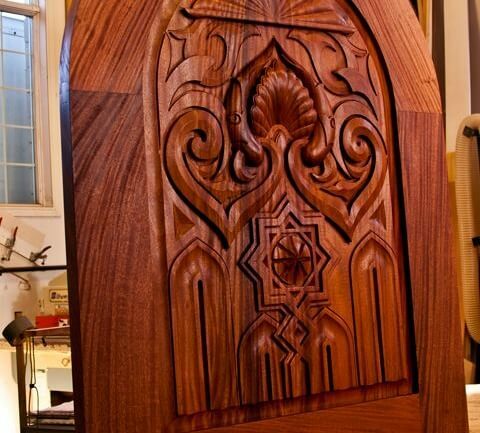 The depth of this inlay allowed for the profiling of the sides. 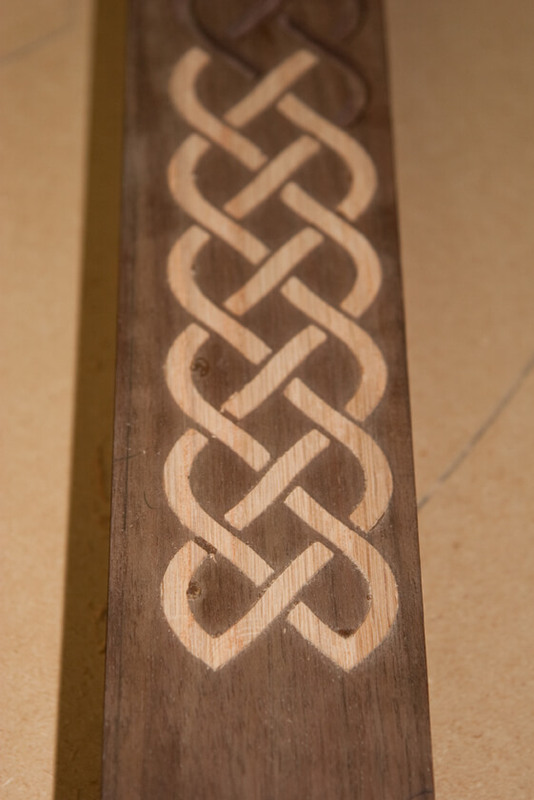 This is the positive portion of the inlay, in poplar. 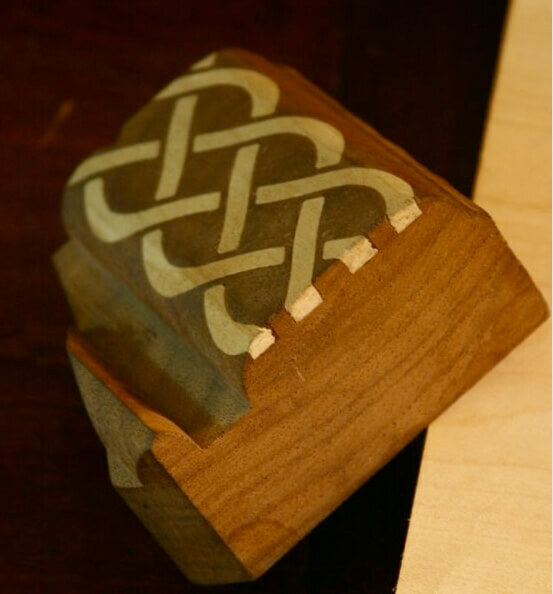 The negative walnut portion of the inlay shortly after inserting the positive form (poplar) and machining it off. These hour-glass posts were produced using 3d machining. 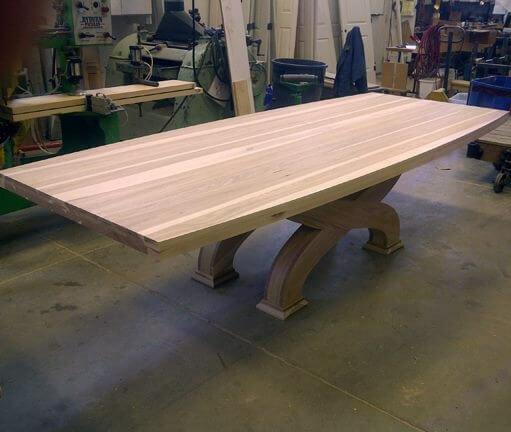 Created as an element in a Television Show sponsored by the famous hunting rifle company, this table top is 3" thick. The design sits beneath glass. 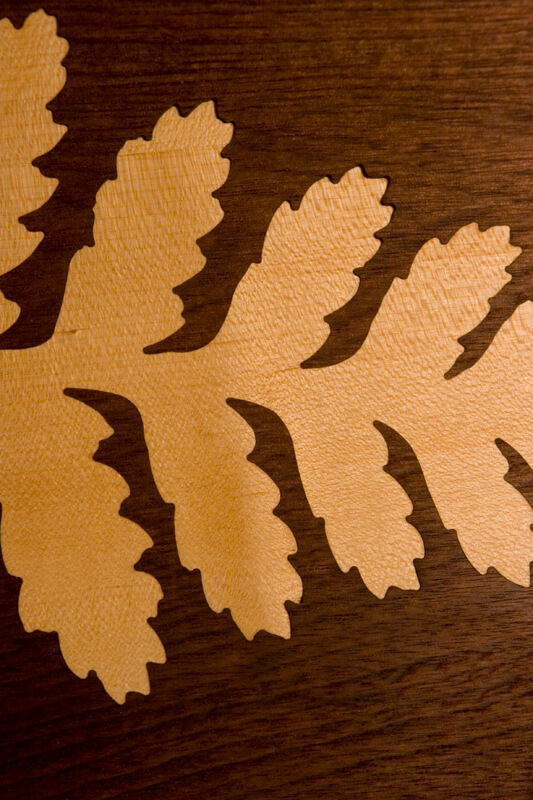 A close-up of the detail in this thick, elm table. 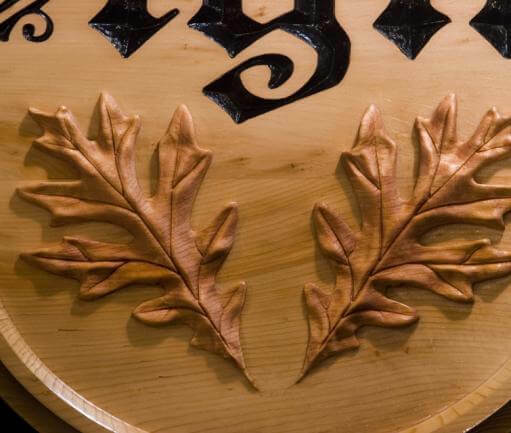 A birch inlay in a butternut plaque for a local municipal client. 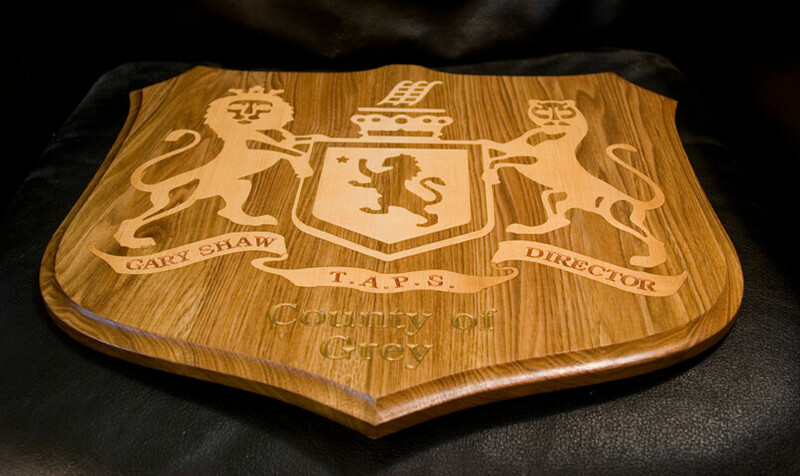 A close up of a custom plaque created for a local municipality. 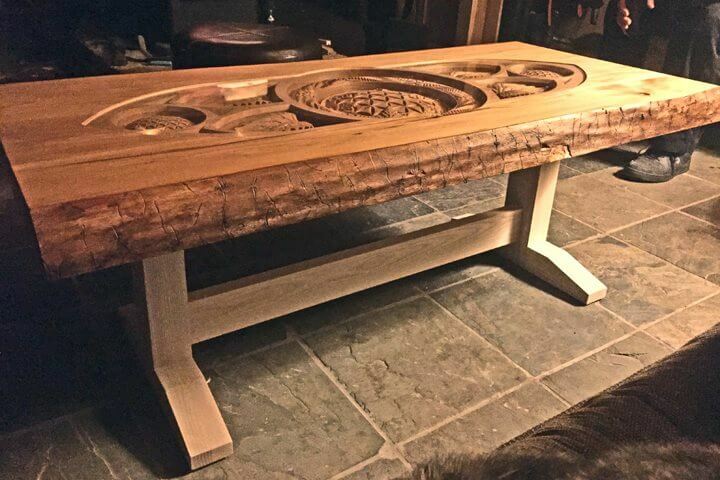 The end grain in this piece really held up the detail. This is prior to sanding/finishing. 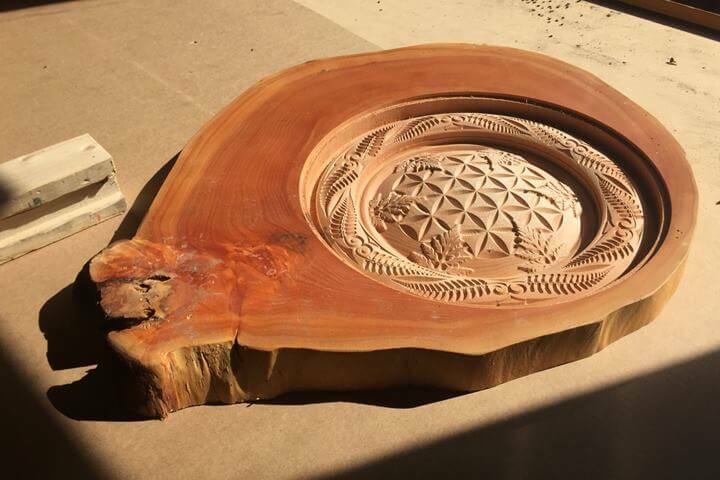 The concentric grain of the tree will be well-emphasized when this prototype carving receives an oil finish! 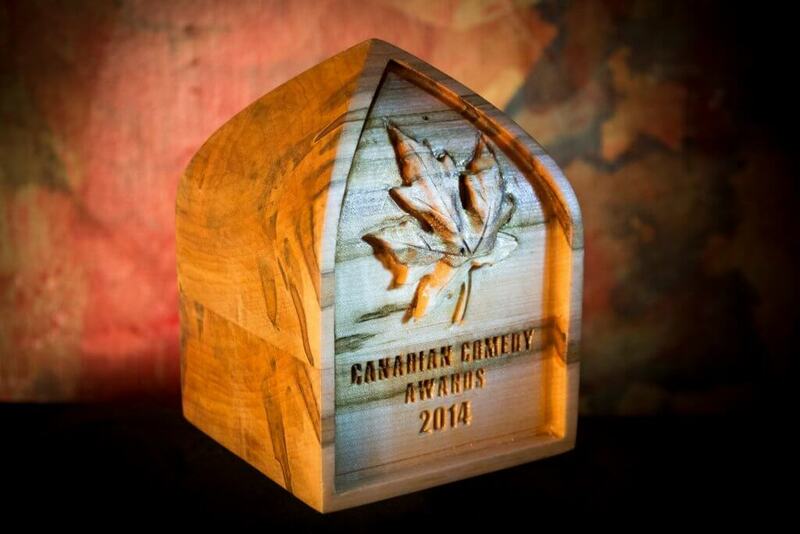 This was presented at the Canadian Comedy Awards. 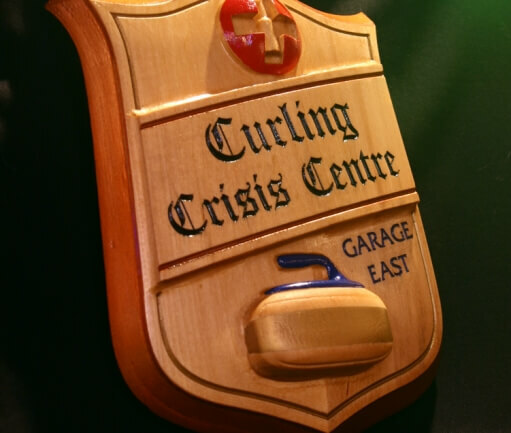 It contains a 'magic eight ball' (the message appears on bottom) in honour of the late comedian, Phil Hartmann. This table was a team effort, and was prepared to receive inlaid text. 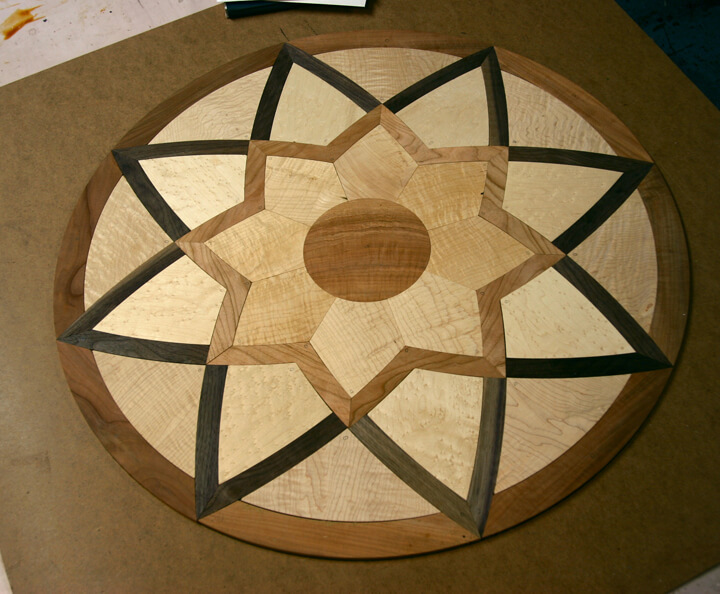 The client requested a walnut inlay into the table. 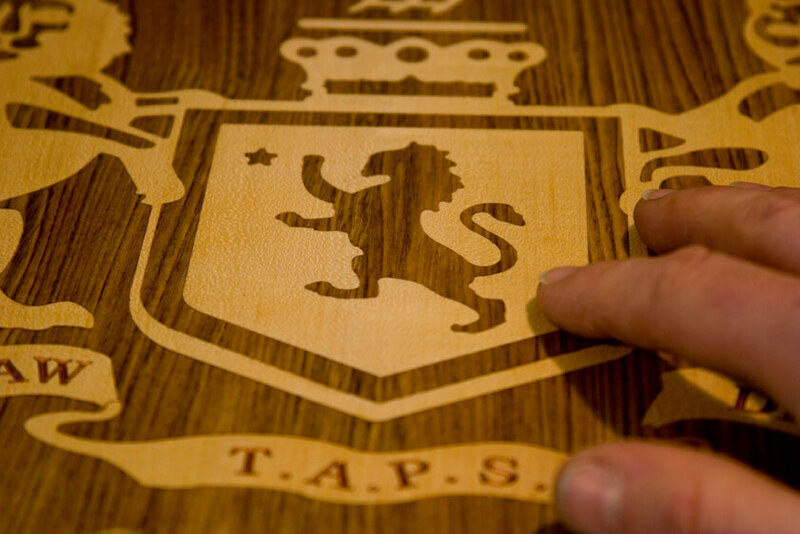 The inlay is 3/16" deep, allowing for future sanding and refinishing of the table as it ages. 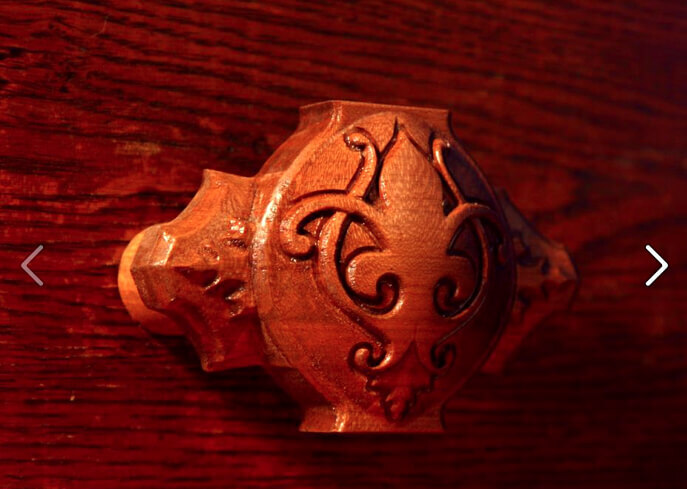 The inlay detail was created with a small 1/16" diameter bit. 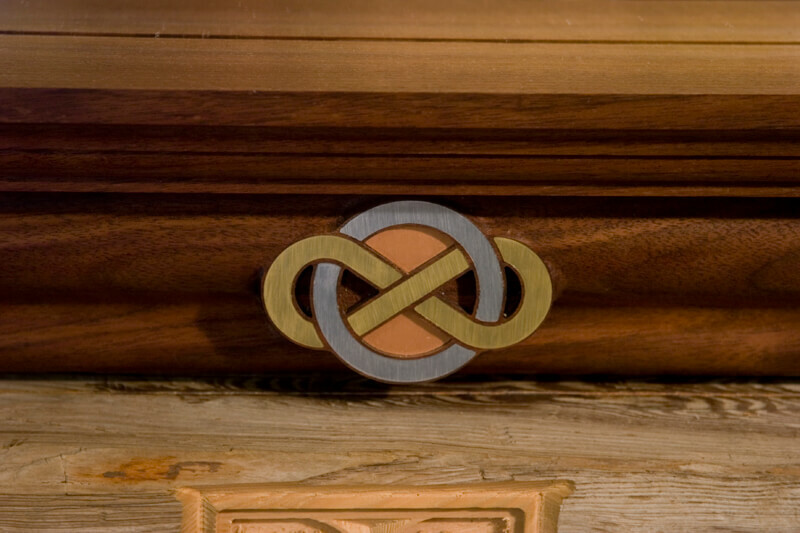 A custom drawer pull designed to match the rest of the hardware on a chest of drawers. 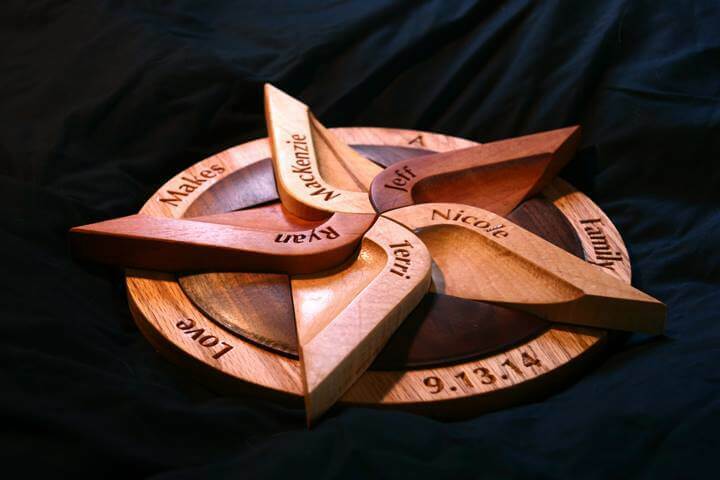 This wedding gift exhibits members of two families. 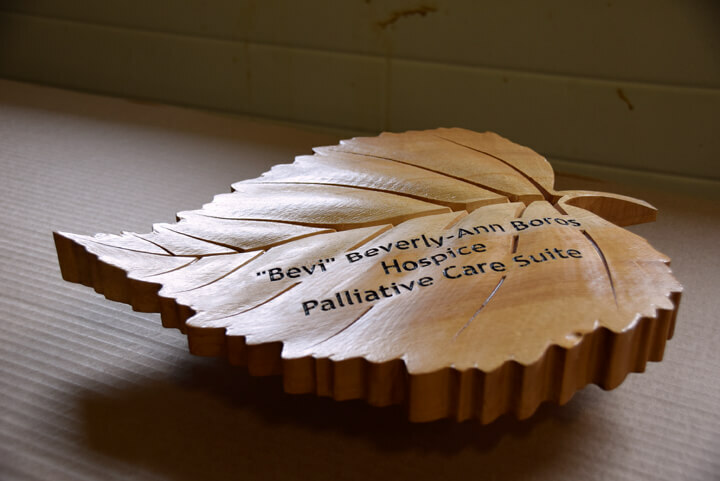 This carved leaf displays the name of a donor to a hospital expansion project in Northern Ontario. 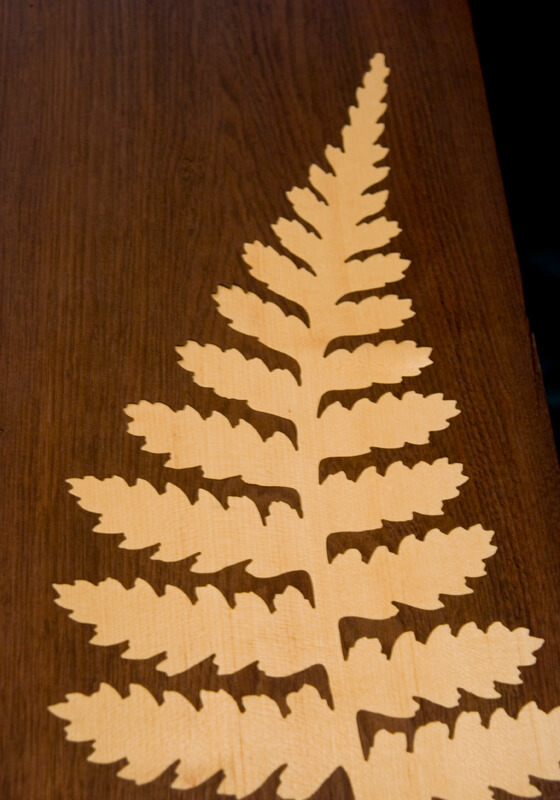 The final project may involve many carved leaves in total. 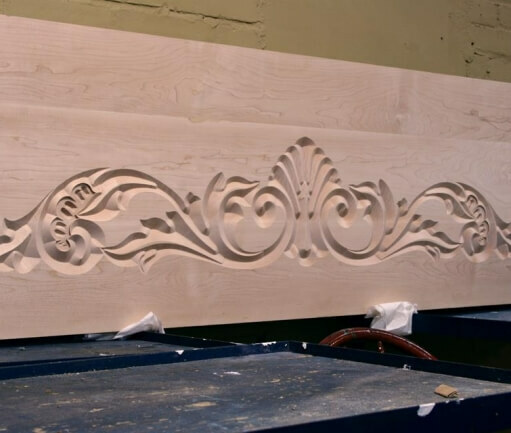 This headboard for a bed had a custom design drawn and machined into maple. 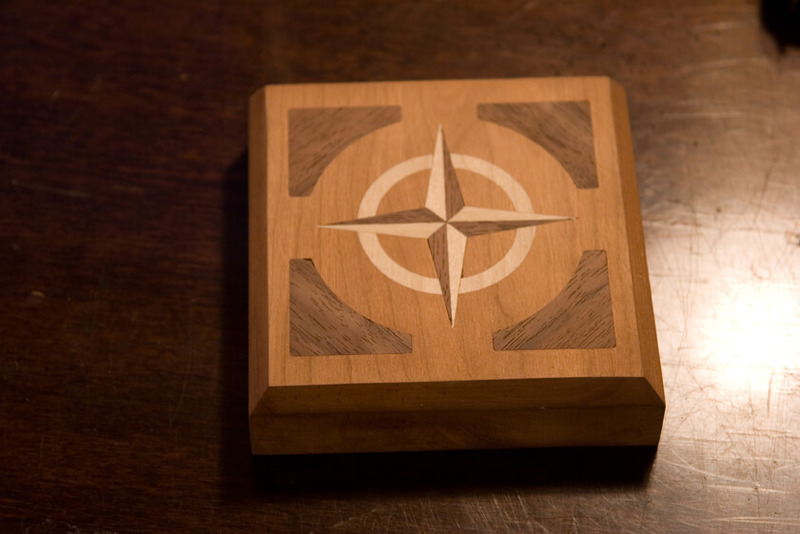 Compass stars are a very popular image to render in custom wood projects. 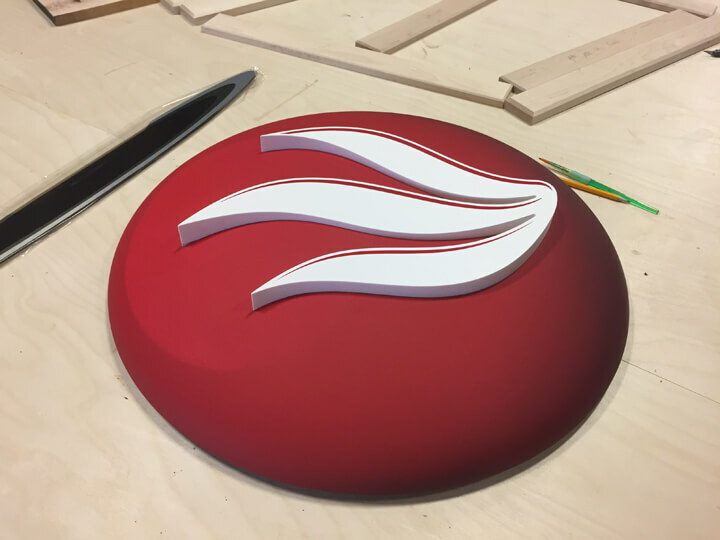 This inlay was designed for a piece of custom furniture in Owen Sound. 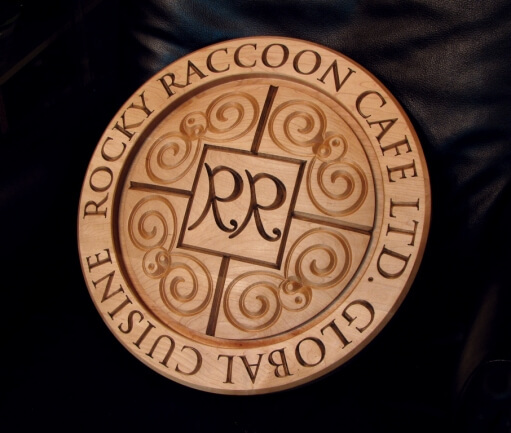 Fine tooling produces very fine results when producing inlay work. 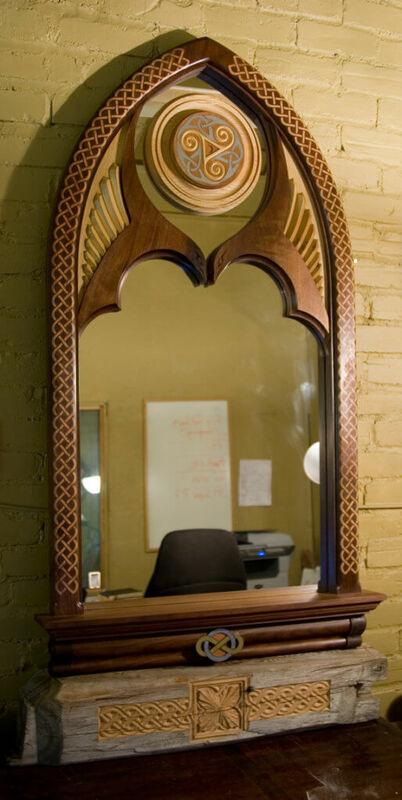 A custom mirror crafted of walnut and birch. 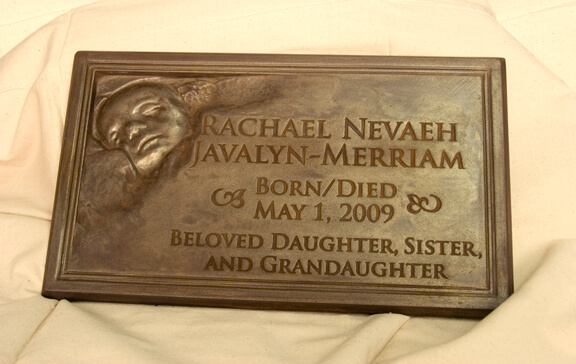 This gravestone was cast in a styrofoam mould that we machined using an ultrasound photograph. 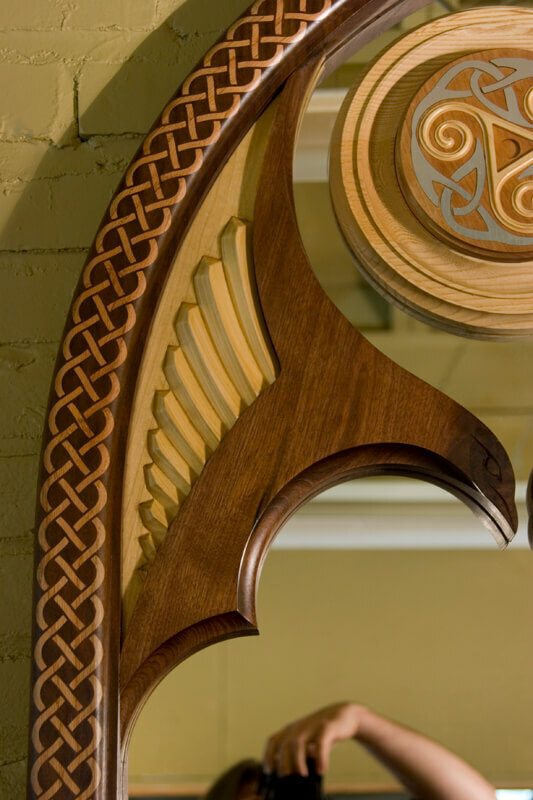 This client's goal was to replicate the artwork on an ancient horn, as seen in a photograph. 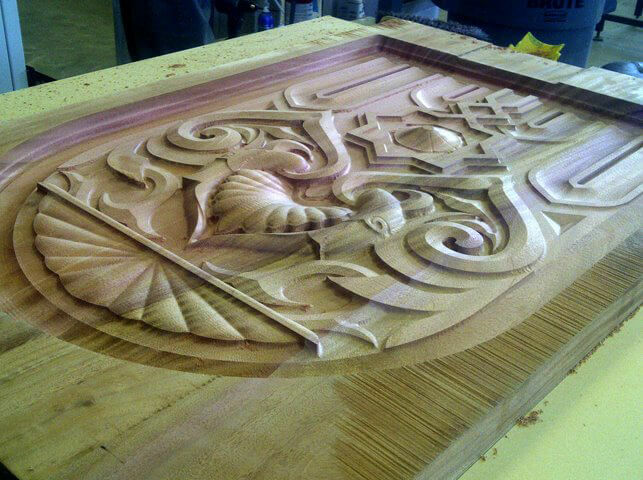 CNC technology makes this intricate work possible. 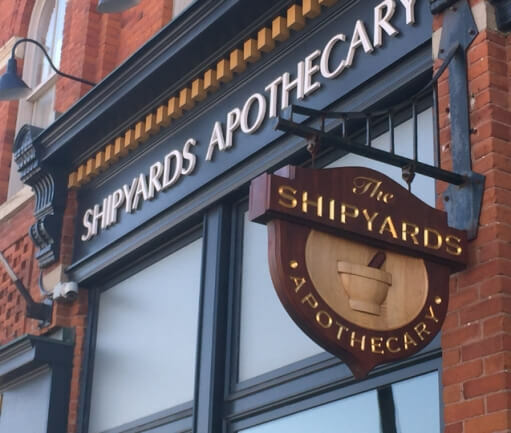 Commercial Signage is constructed out of a variety of different materials and is often installed outdoors, where the sun, rain and temperature are important considerations. 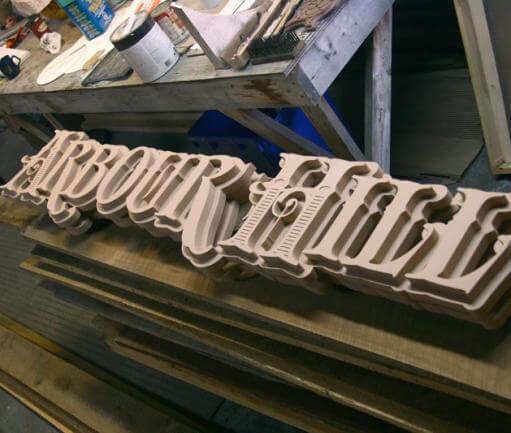 Illumination is one of the main challenges with this type of work, and signs can be internally lit, with glowing, projecting letters, or Halo lit, with a glow around the letters and other elements. 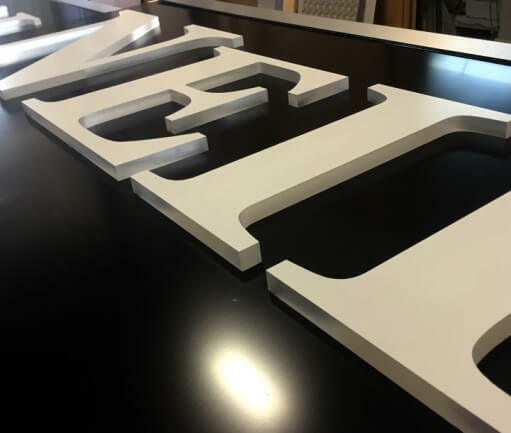 Raised letters, carved or stacked elements, and incised lettering are other ways to enhance the dimension and presence of these signs. 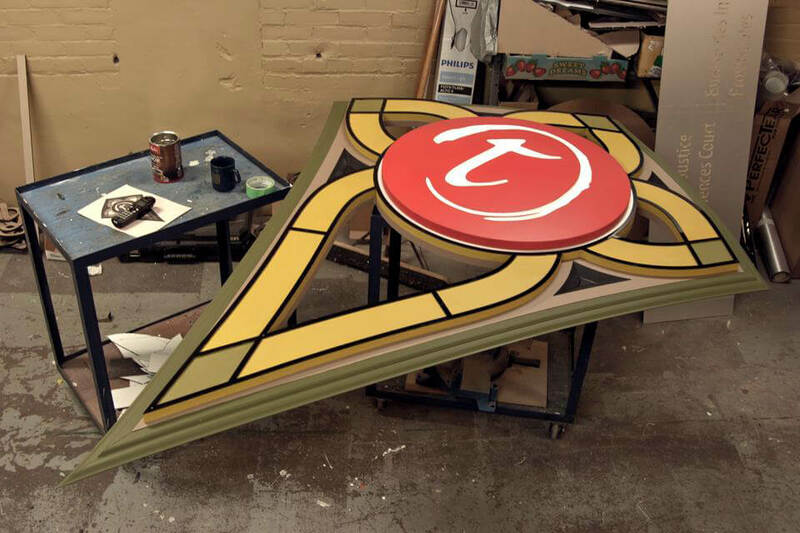 The central sign is internally illuminated, with the motif rendered with an outdoor mdf product called extira. 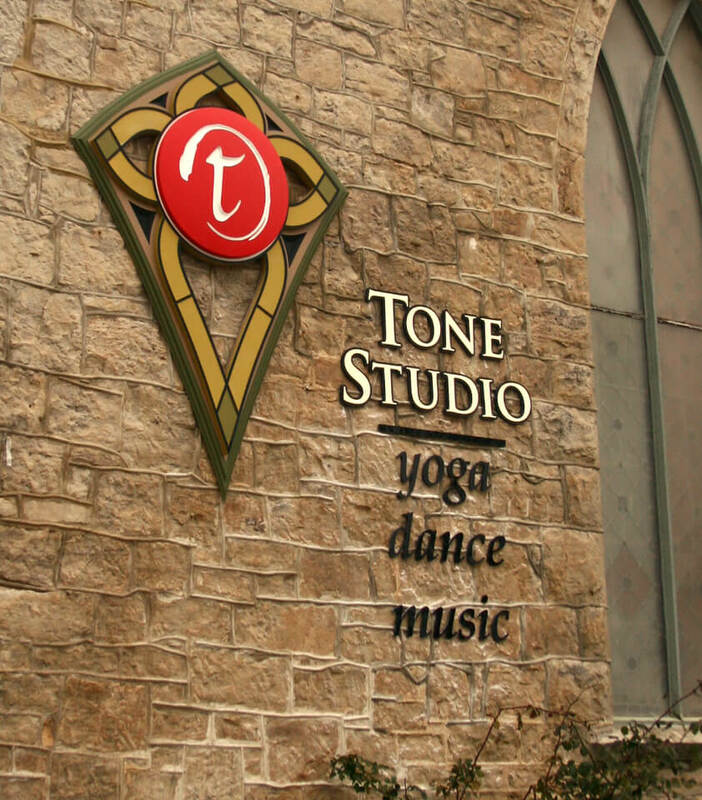 Original stained glass from this building led to the development of this decorative motif and logo. 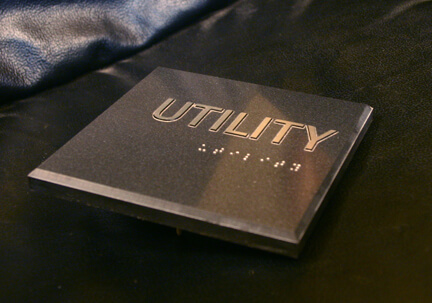 Braille plaques with tactile lettering are one of our specialties. 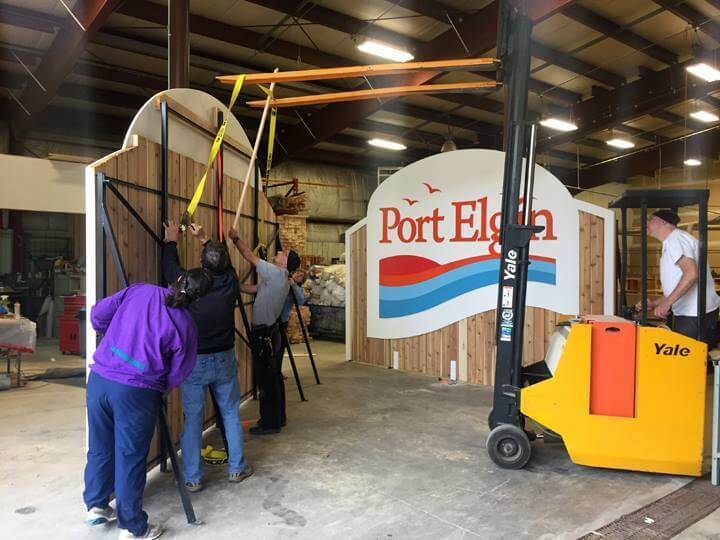 We can produce great numbers of these units for public buildings, apartment complexes or condominiums, in keeping with established governement specifications. 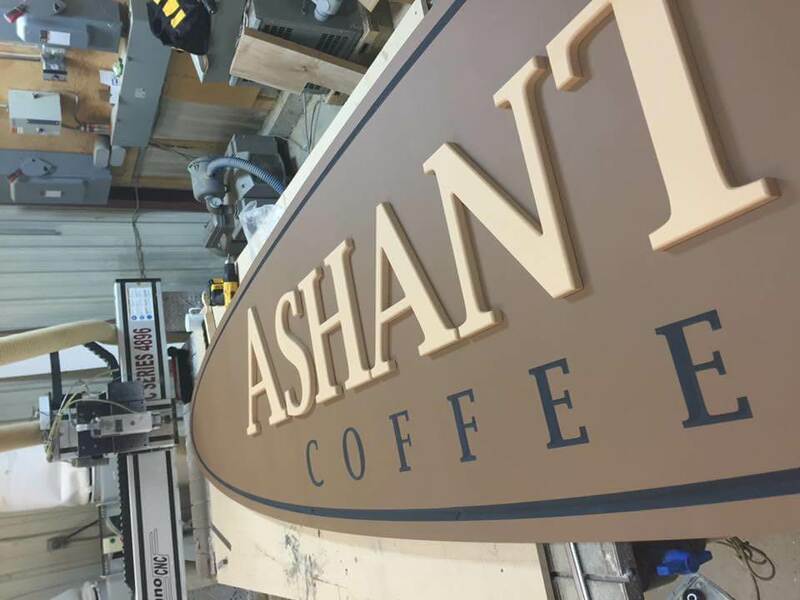 A large, carved coffee cup was carved out of cedar for Ashanti Coffee Company. 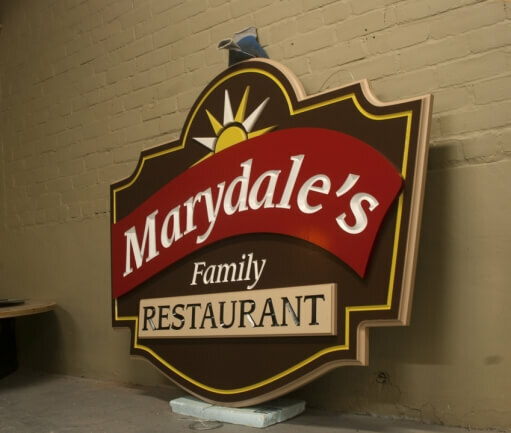 Paint Effects have a major impact on dimensional signs. This one has an incredible presence with its sprayed shadow and highlight. 4' wide, this sign really greets you when you enter the lobby! 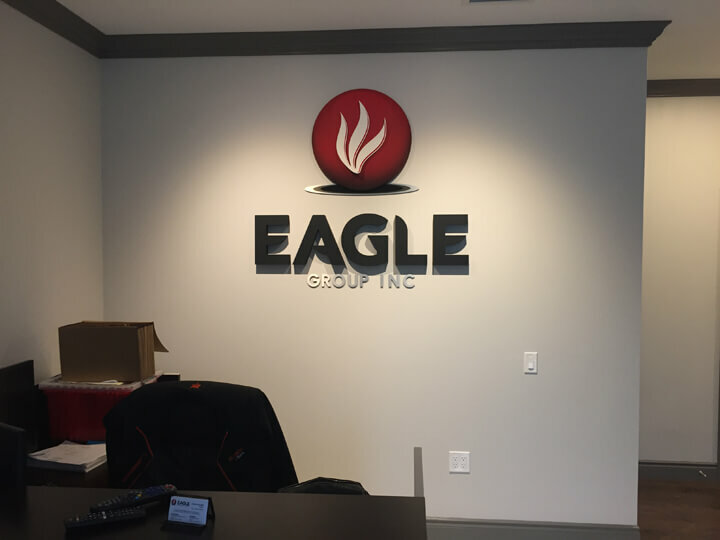 Interior Signs can really enhance your clients' experience at reception! 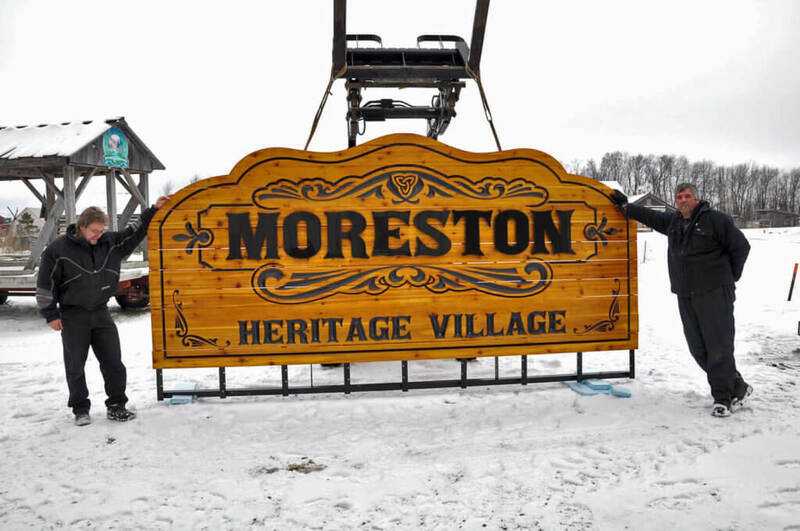 Stacked elements lend depth to this sign. 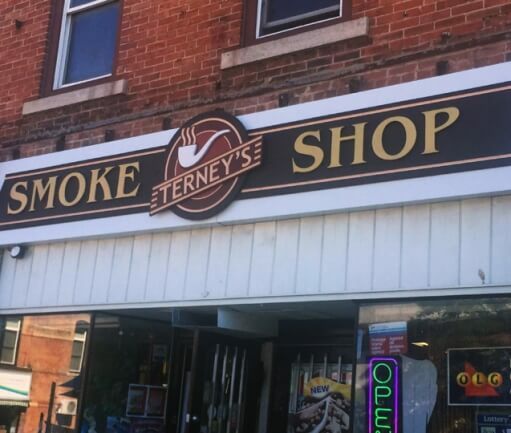 Terney's Smoke Shop was given a facelift with cut letters and other elements stacked to build dimension. 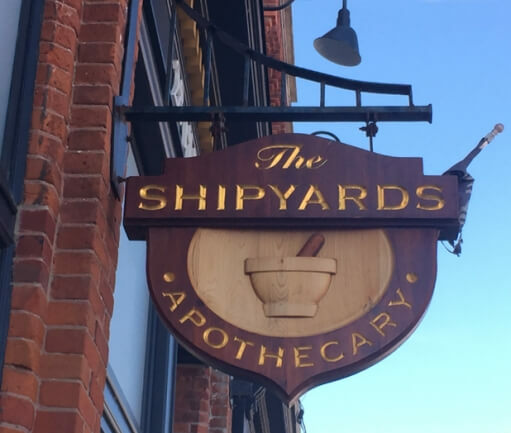 Raised lettering and a carved and guilded overhanging sign give this pharmacy an old-world look. 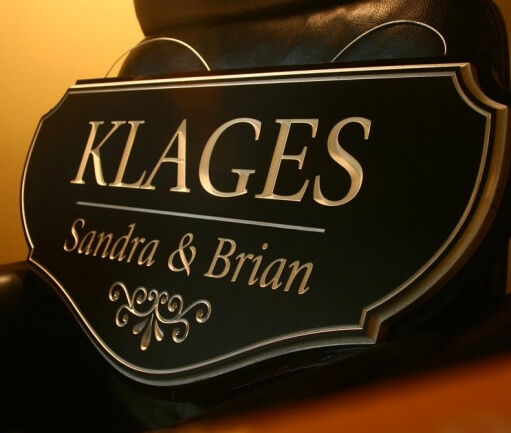 Real gold keeps the lettering bright and classy. 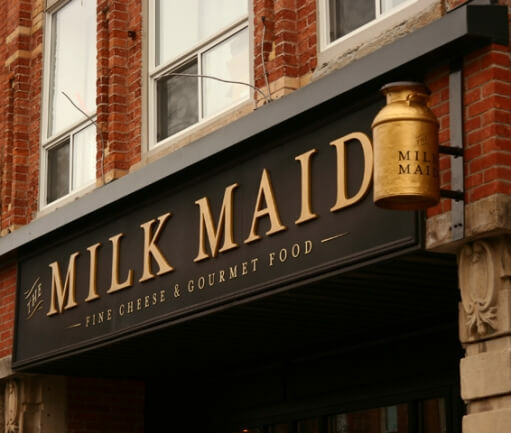 The signage for this coffee shop in Elora was intended to accentuate the old building it resides in. 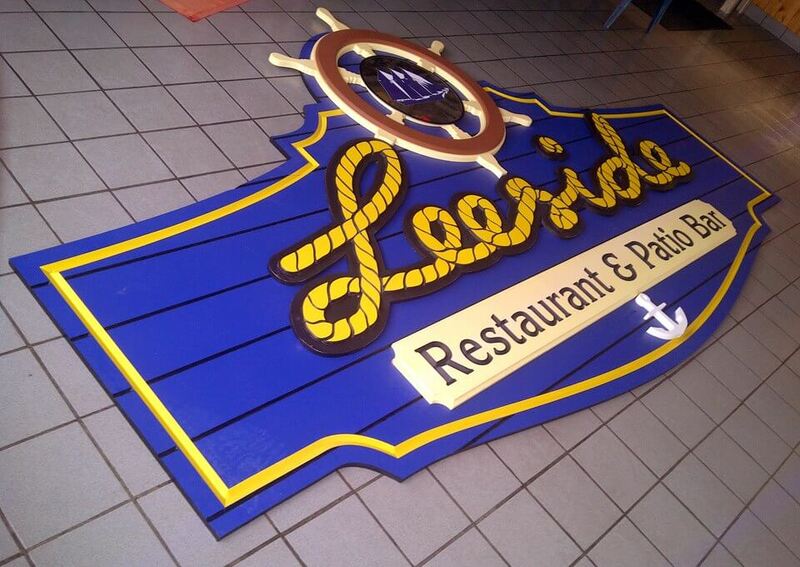 Overhanging Signs are an effective way to garner attention for a business. 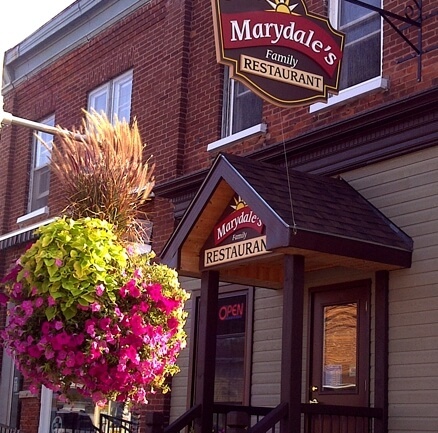 The overhanging signage for this restaurant is very effective in this quaint small town. 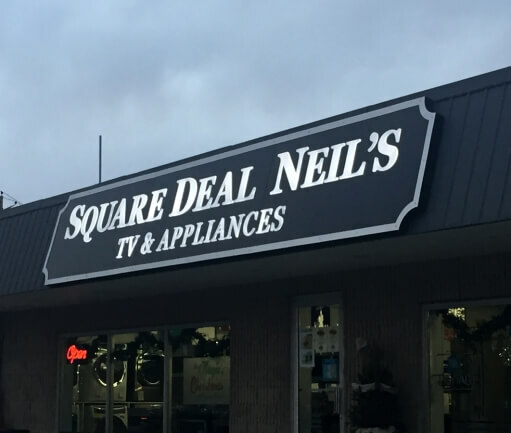 The multi-layered depth of this sign really enhances its interest! It was so large in the shop, at 8 feet in length. 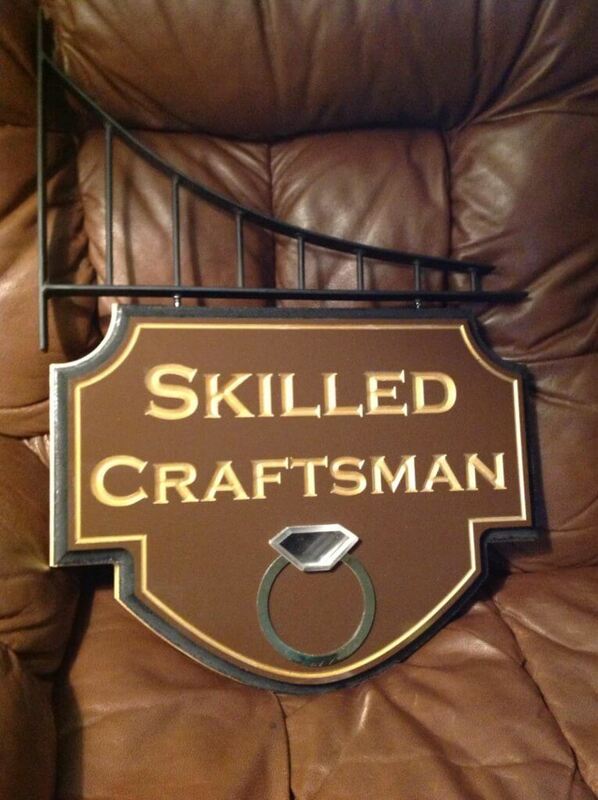 This sign was constructed of materials that have a 30 year shelf life. 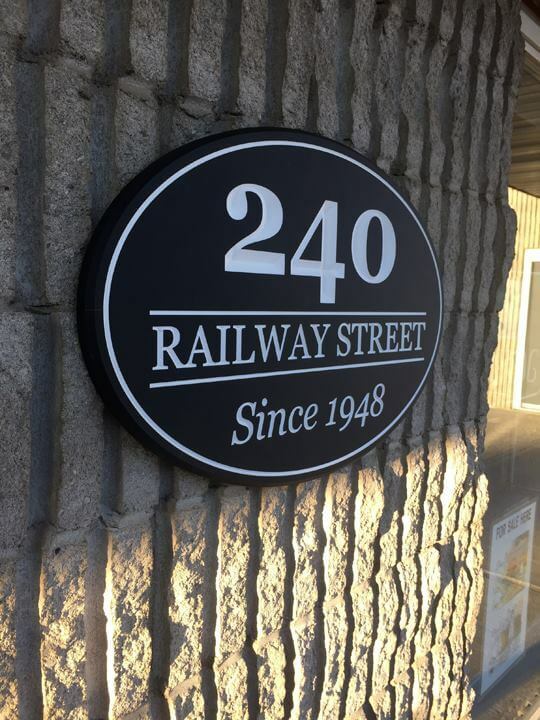 This sign uses a design element from the building it is installed on. 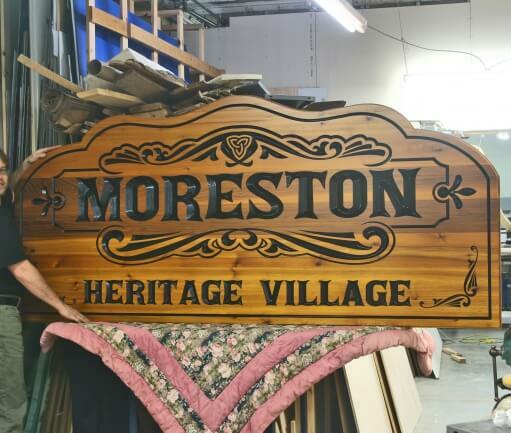 Real gold was used on the lettering of this sign, resulting in a really classy old-style look. These freestanding numbers are brightly illuminated at night. 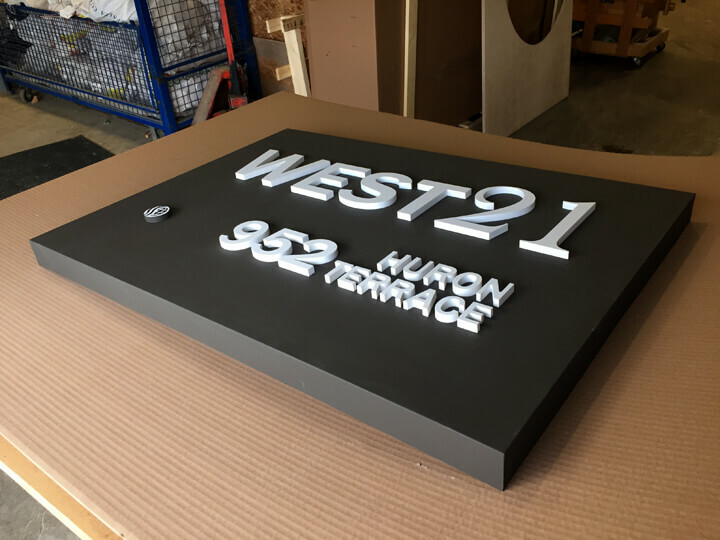 The various elements of this signage, including the coloured rectangles are built for bright internal illumination with LEDs. 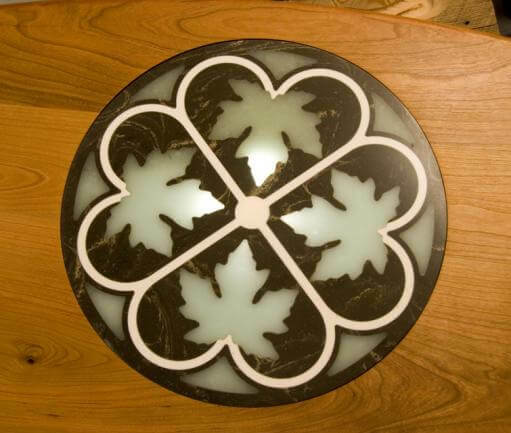 The large elm leaf featured in this design was carved from urethane foam to make it light weight and rot resistant. 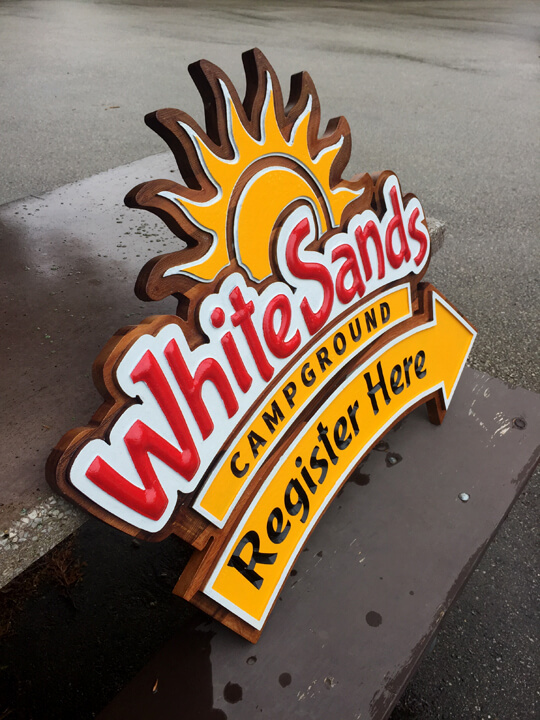 Extira board, a resin-based outdoor wood-particle product, was successfully used for this overhanging sign. 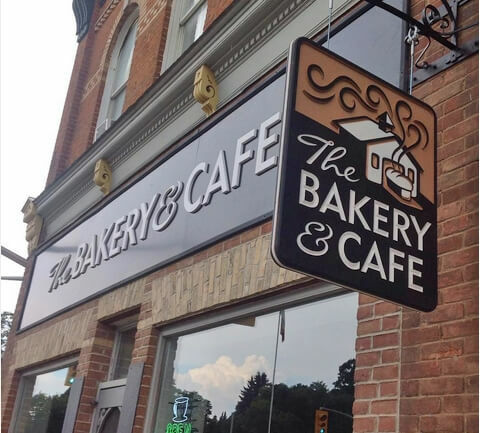 Raised lettering and the incised details of the overhanging sign make this bakery stand out in a quaint location. 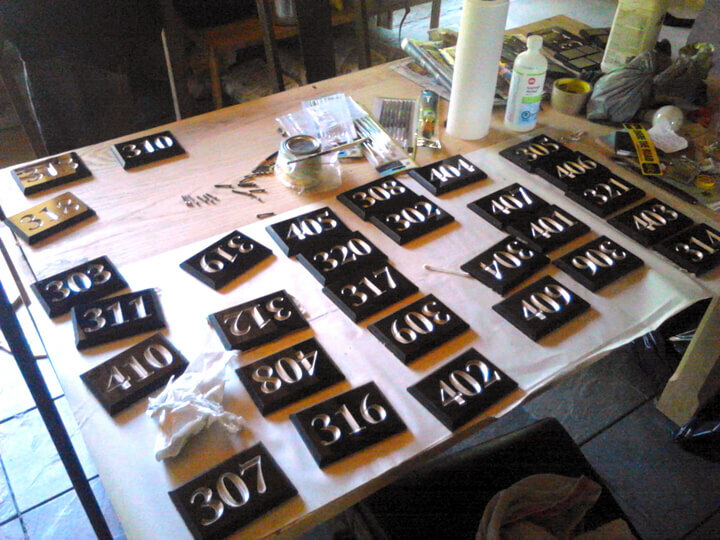 Mass production of acrylic plaques for a government housing project. 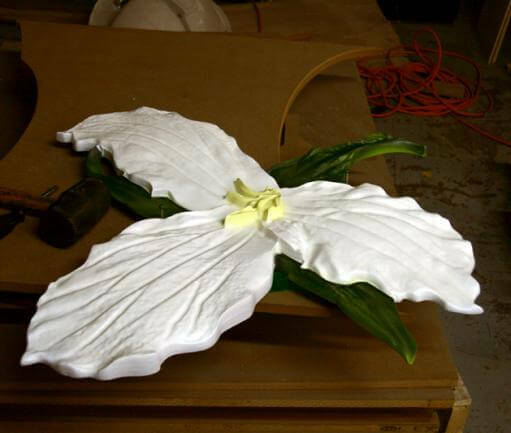 The client provided a photo of a trillium she had photographed, which was the basis for this carved version. 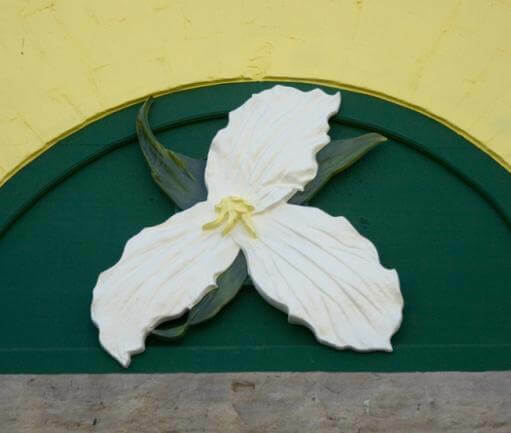 Carved Trillium Installed. 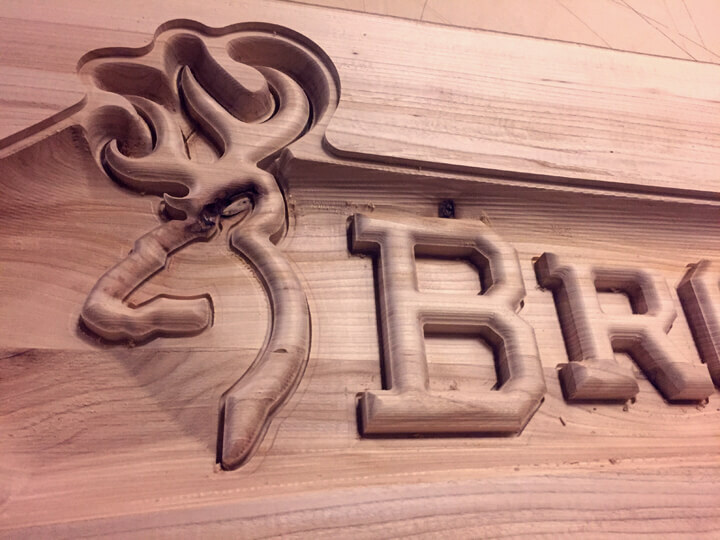 We can do some unique work when carving from photographic images! 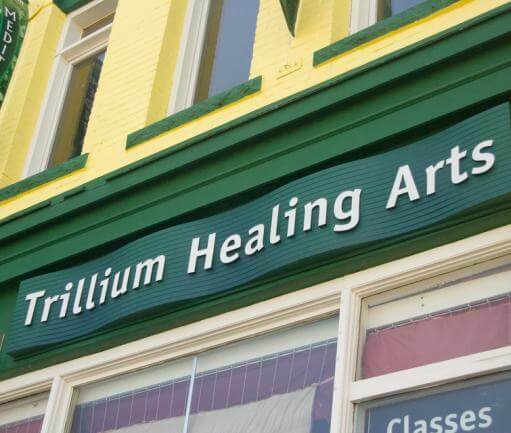 Trillium Main SignThis sign is about 14 feet long. 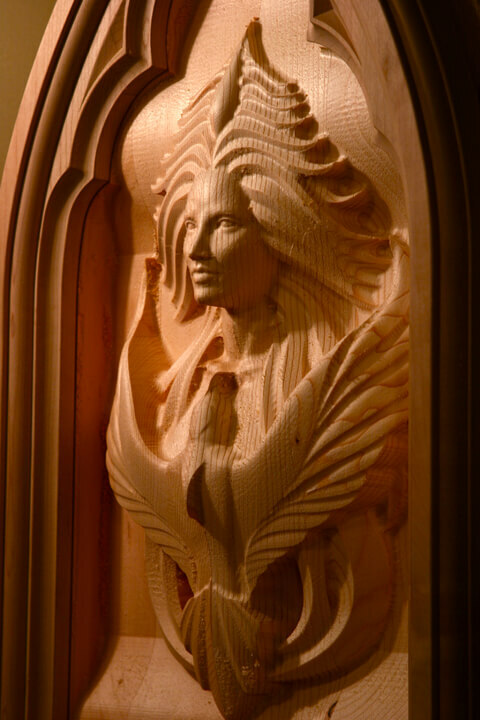 It was carved from High Density Urethane. 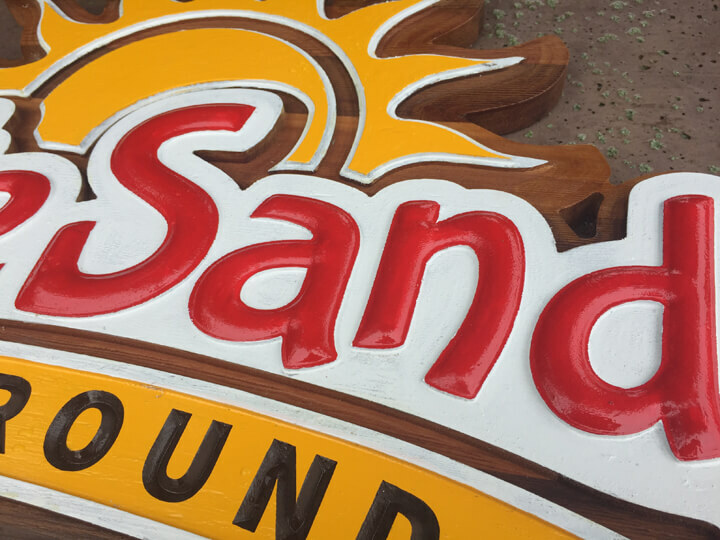 The undulating surface of the sign lends a desired feel to the business. 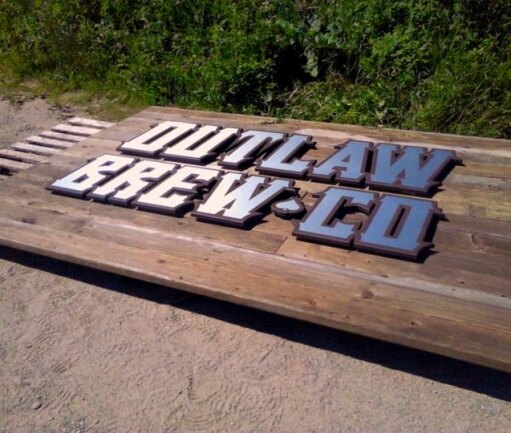 Metallic finishes against a rustic background cause this sign to really stand out. 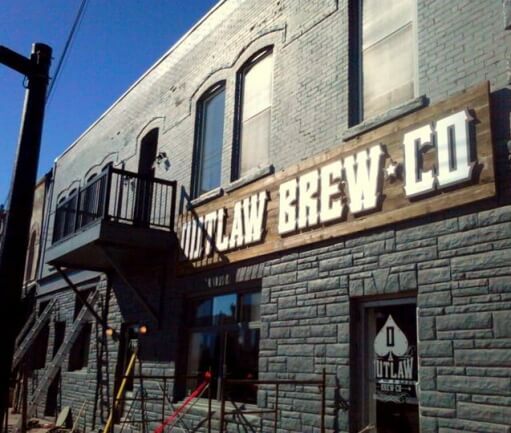 Brushed silver really stands out against the painted brick of this brewery. 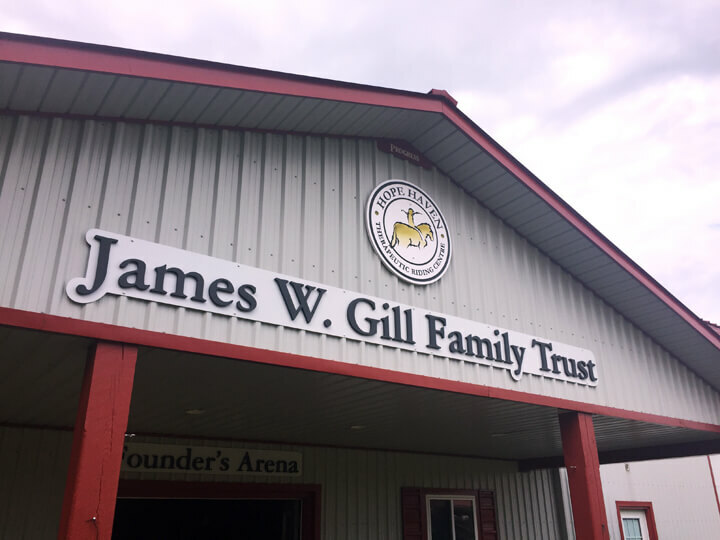 Double-sided and high in the air, this sign for a municipal office is quite striking! 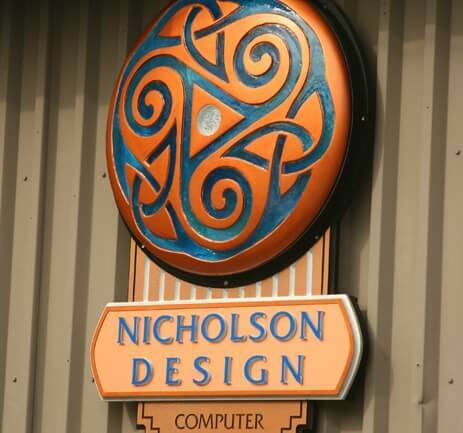 The convex design of this sign was cast using clear liquid plastics, and lights up a beautiful blue colour at night. 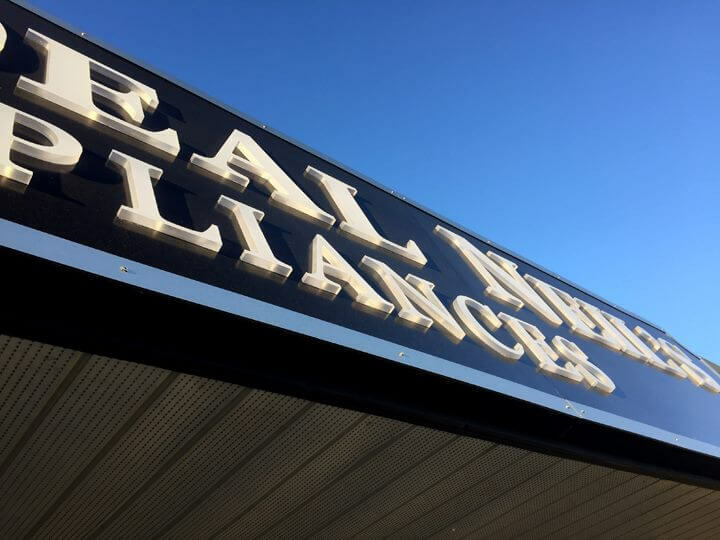 Polished gold and silver make this sign very eyecatching. 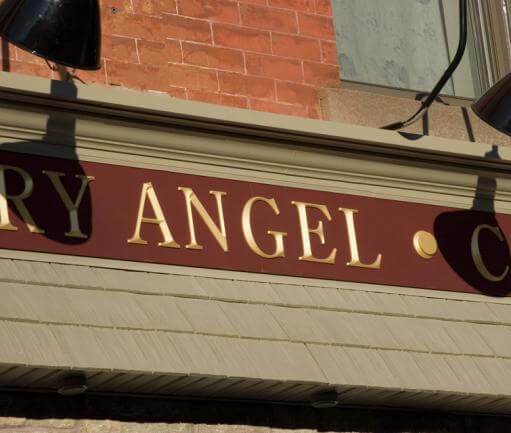 Clear acrylic, which projects from the face of this sign, glows brightly at night. Raised, internally-lit letters, known as "push-through" letters, are common in corporate applications such as banks. Allow us to bring this modern look to your enterprise! 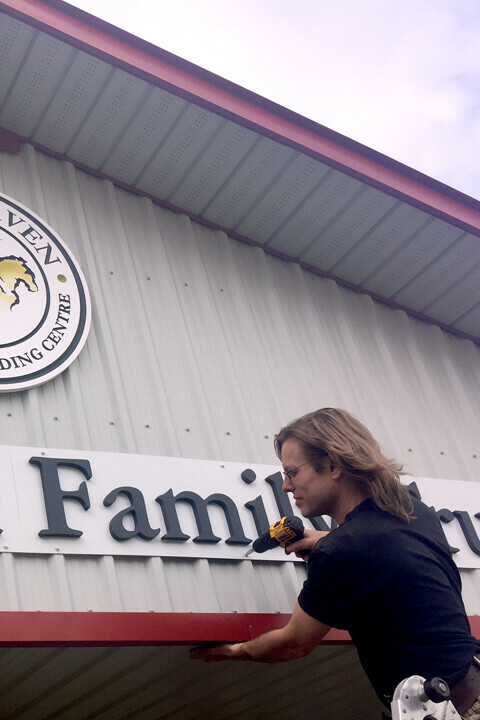 The sign was built in three sections. The well-illuminated text is seen from a far distance. 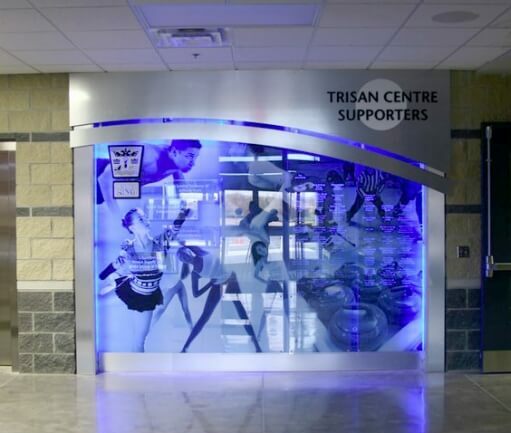 This donor wall uses acrylic, glass and light to highlight contributors to a new arena. 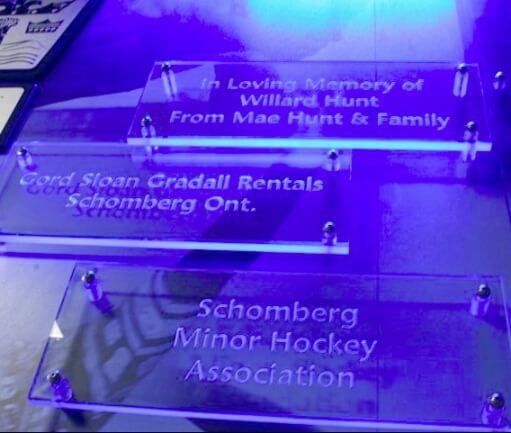 Donor's names, machined into clear acrylic, glow when the light hits them. 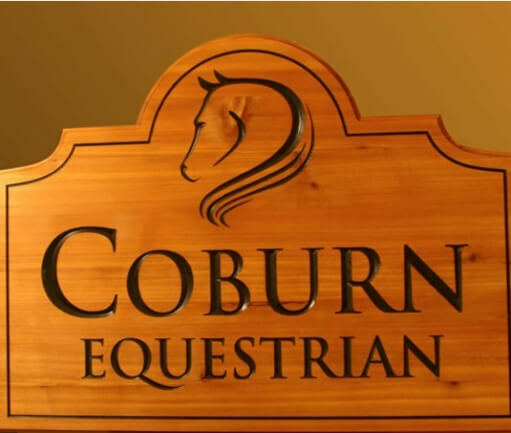 The gold border of this cedar sign really stands out. 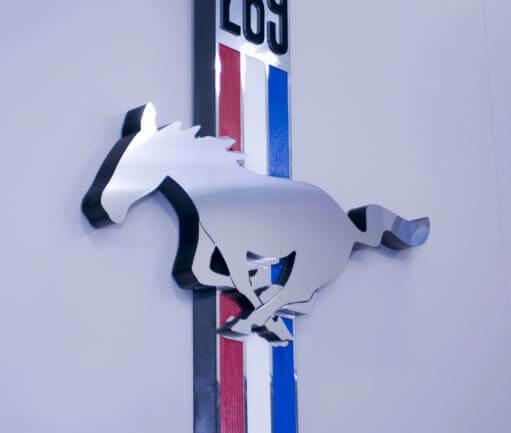 4' tall, this rendition of the mustang emblem adorns a vintage car collection. 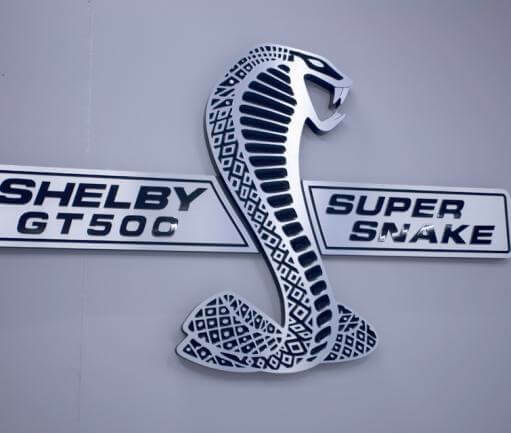 Shelby Super Snake Emblem This emblem was taken from a photo on a mustang car and redrawn. It is 4 feet tall, and 2 inches thick. The face of it is brushed metal. 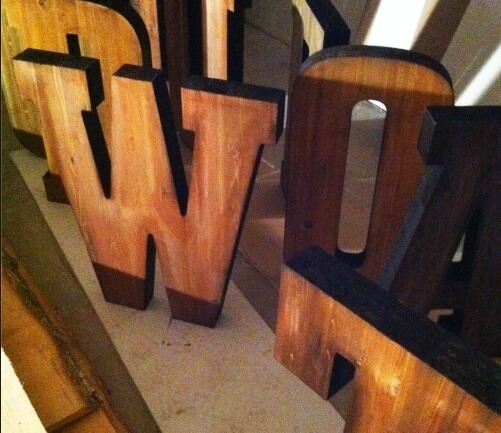 These 3' tall cedar letters required specialty planning at the glue-up stage. 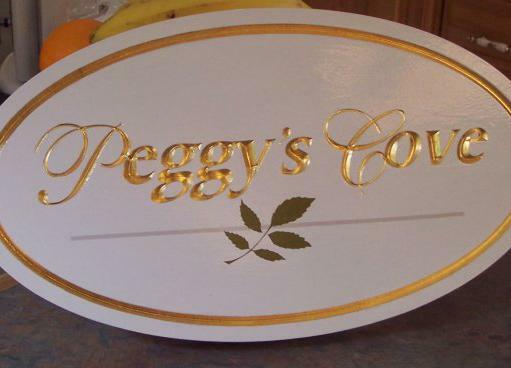 Delicate lettering can be cut, painted and gilded in any letter style. 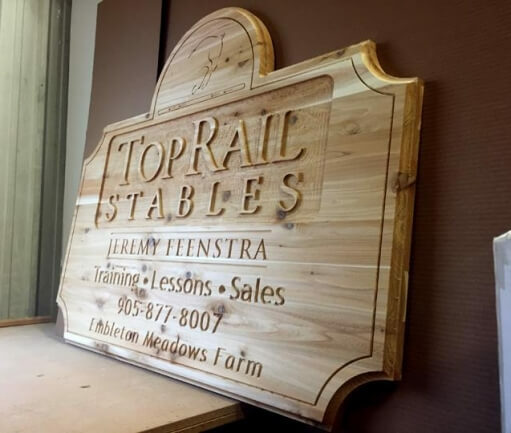 This large cedar sign was very impressive to glue up. 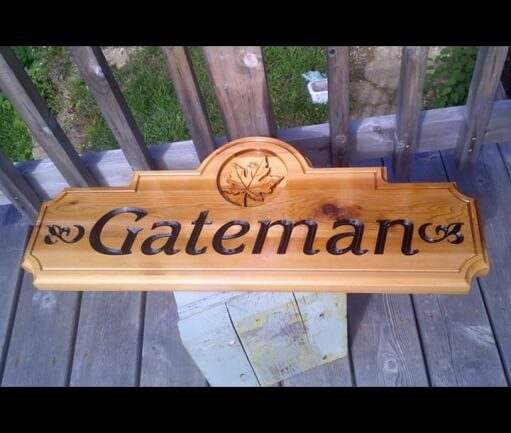 A much larger version of this cedar sign was rendered on a welded frame. 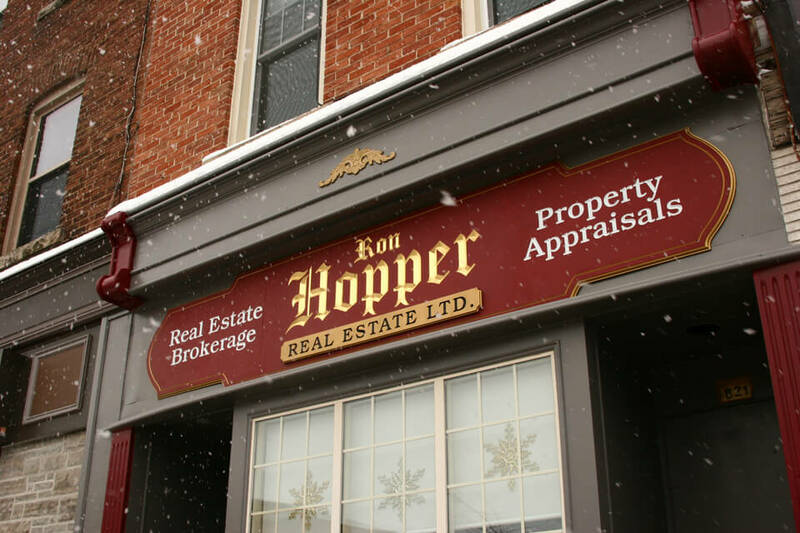 Individual painted letters can look great on old buldings. 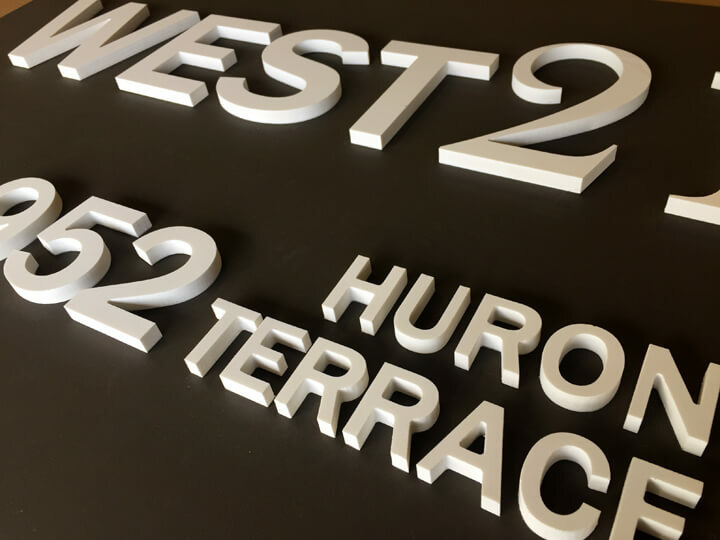 Small letters can be cut from various colours of aluminum composite and attached to walls. 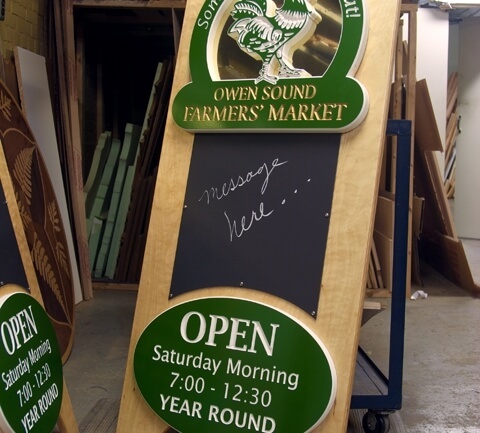 Sandwich board signs with a warm invitation. 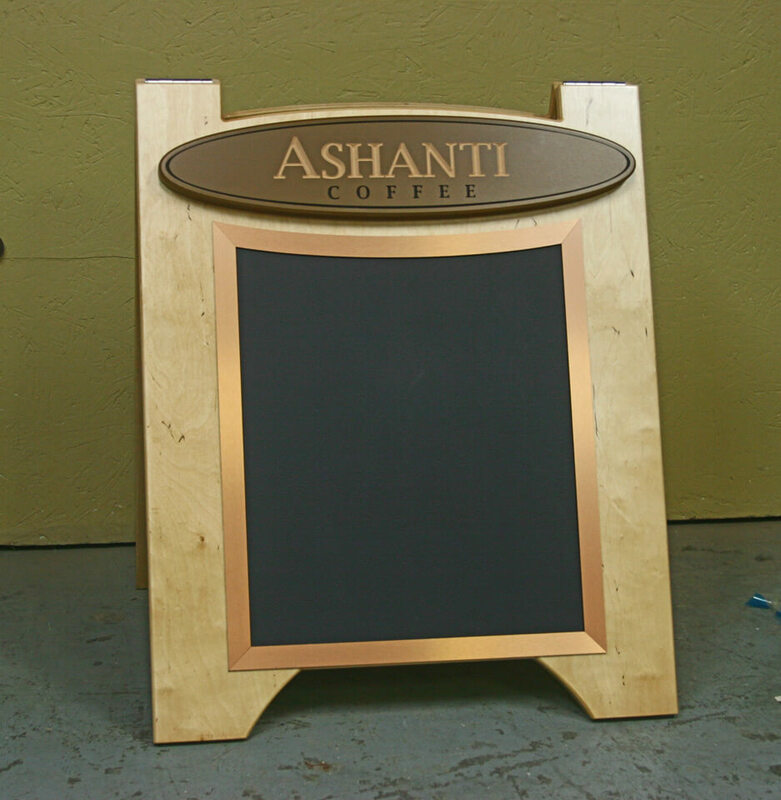 The bronze border around the chalk board adds a subtle but effective accent in the sun. 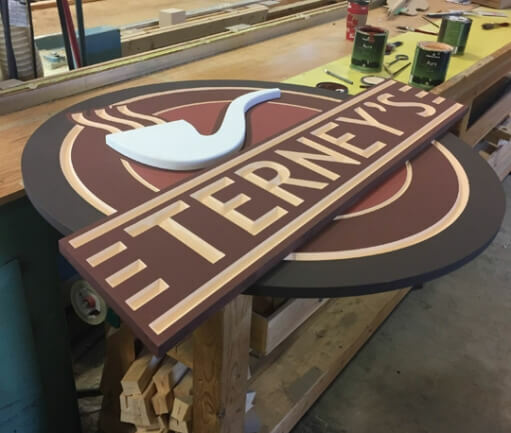 Sandwich board signs can be very elaborate, including additional signs mounted to the top. 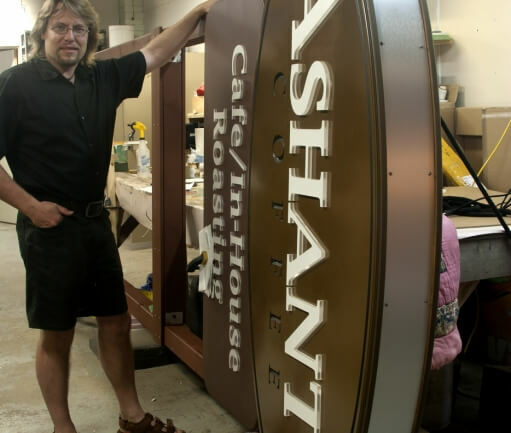 This facade sign for the Ashanti Coffee Company was seamless, at 16' length. A welded aluminum frame made it both rigid and aided in installation. 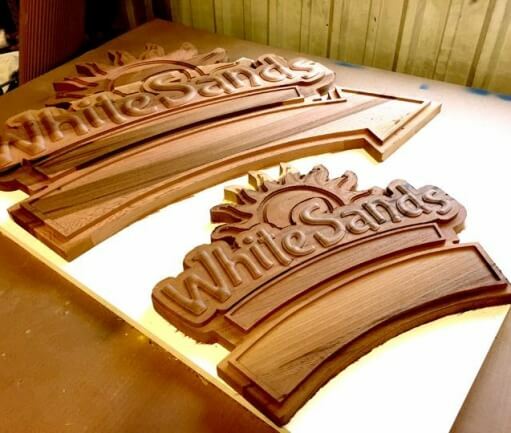 Specialty formica laminate combined with v-carving brought this door sign to life. 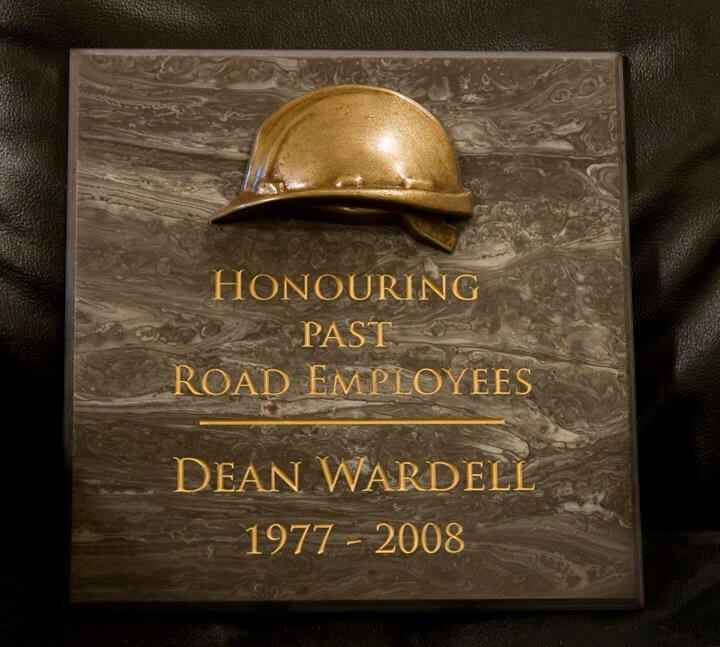 The hard hat in this plaque was cast in a styrofoam mold we machined out of styrofoam. A special casting cement called 'winterstone' was used, impregnated with brass particles. 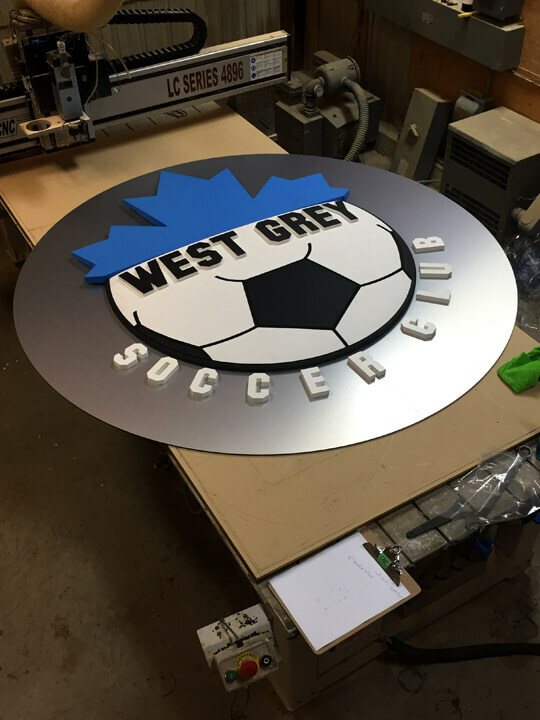 6' in diameter, this convex sign graces a soccer field. 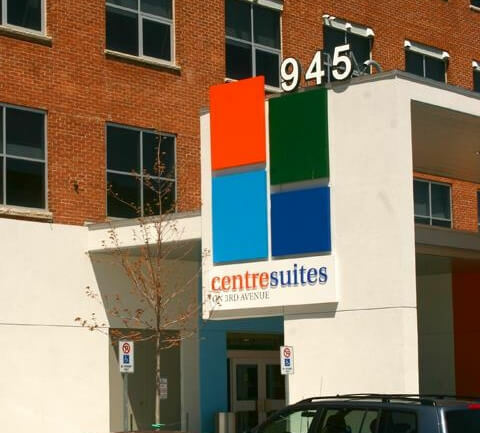 This apartment building sign sports a folded enclosure, custom paint and thick letters based on the client's logo. Raised text is so appealing! 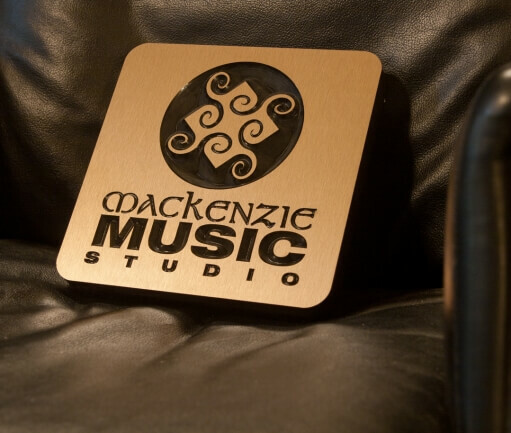 Call us to get your company logo rendered with depth! 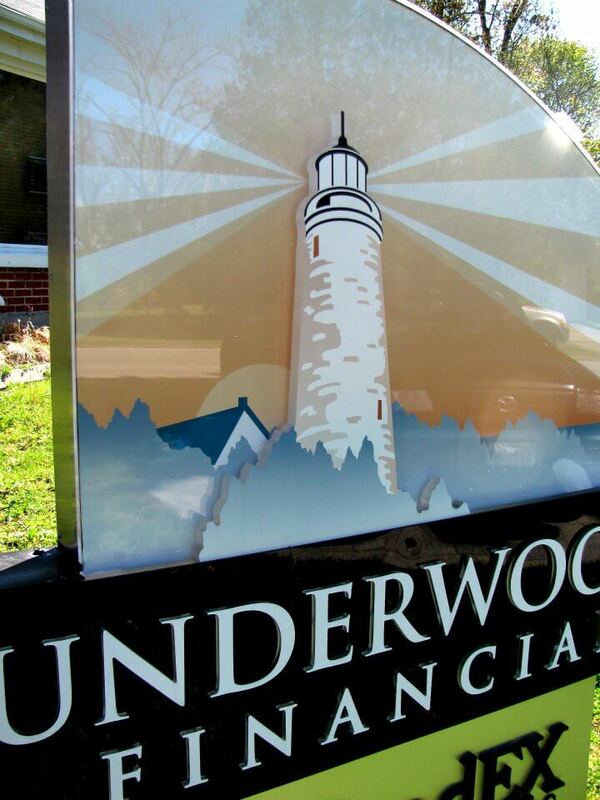 This small overhanging sign has a clear acrylic diamond. 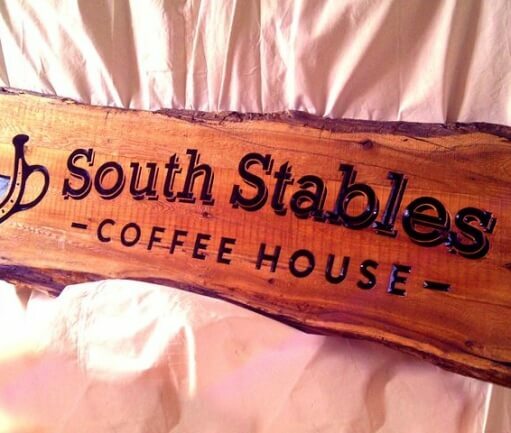 Carving this sign into a large wood slab resulted in the rustic look that suits this cafe. 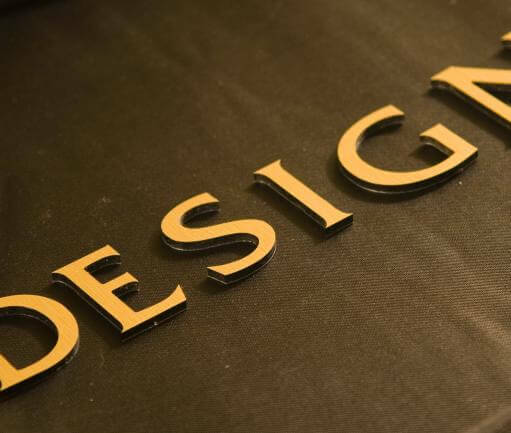 We provide templates to allow purchasers to get involved in installation as desired. Individual Letters really dress up corrugated steel structures. 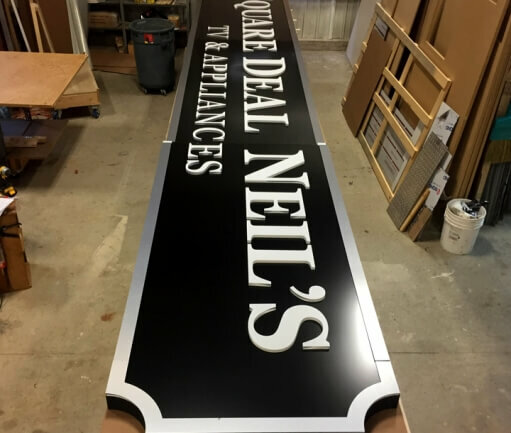 This sign is 16' long. It greets you as you get off of a ferry on Georgian Bay. 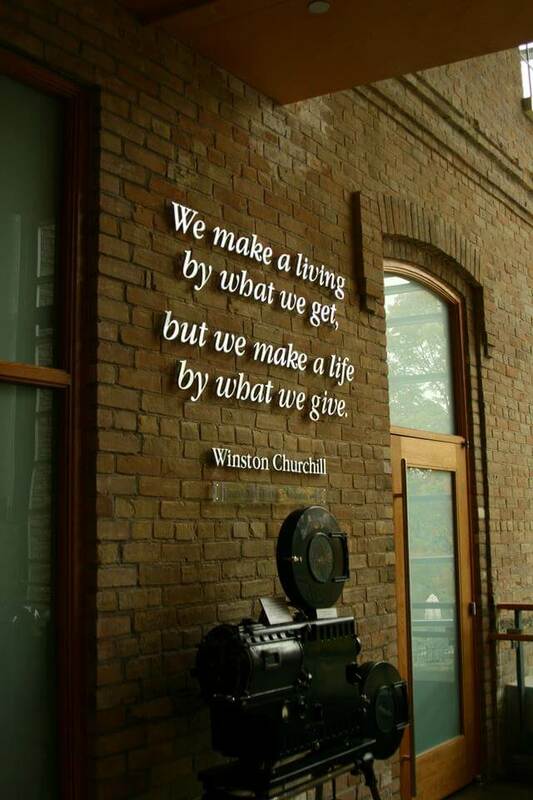 We regularly produce lettering that is mounted directly to walls. It looks really good installed inside of this museum! 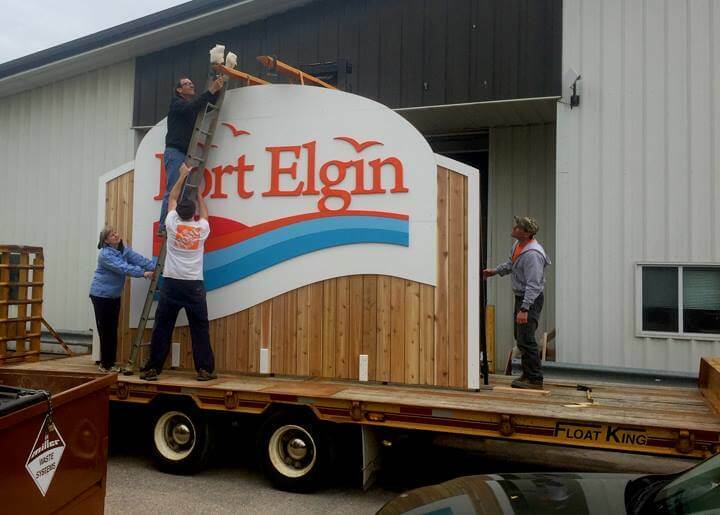 Three large municipal entrance signs required a team effort! 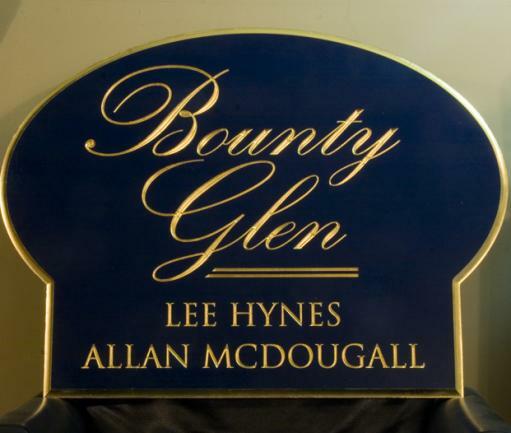 Call us to get a quote on entrance signs for your town or region! 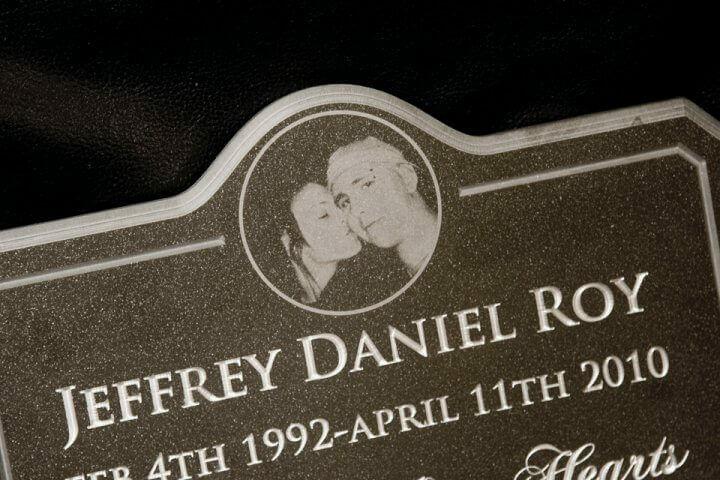 Machining and laser were combined to produce this plaque. 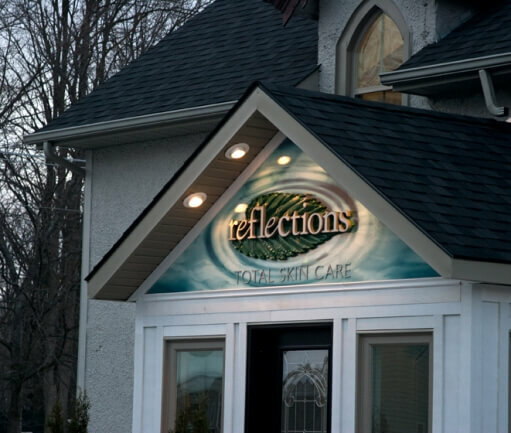 Freestanding and Internally lit, this sign is constructed of a series of translucent images separated by thick, clear acrylic. 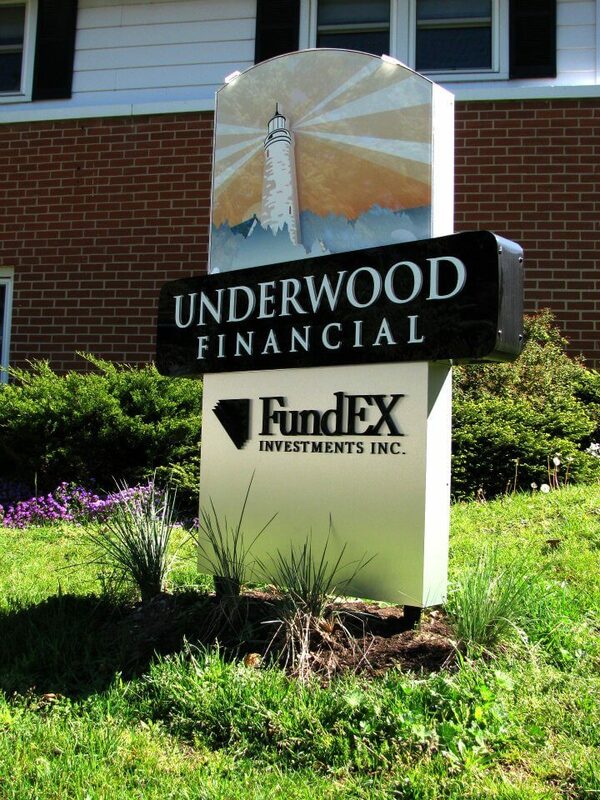 The various layers, coupled with metallic finishes give the sign a strong sense of quality and value one would associate with the financial service. 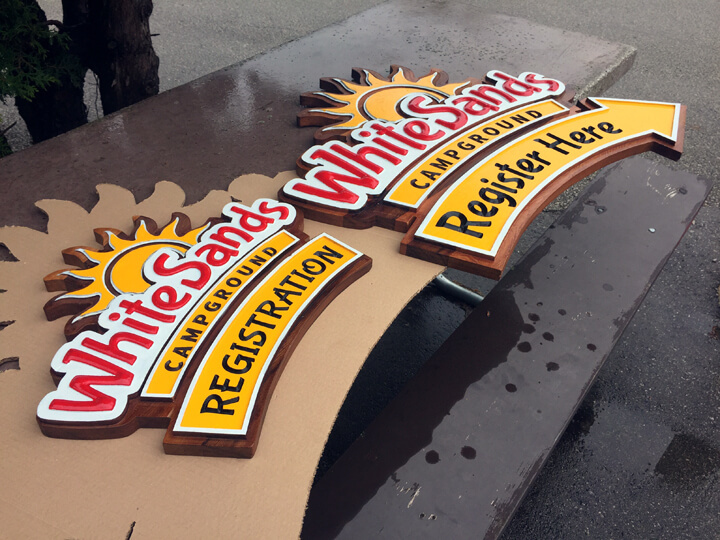 Carved Sign Foam is a great medium for overhanging signage. 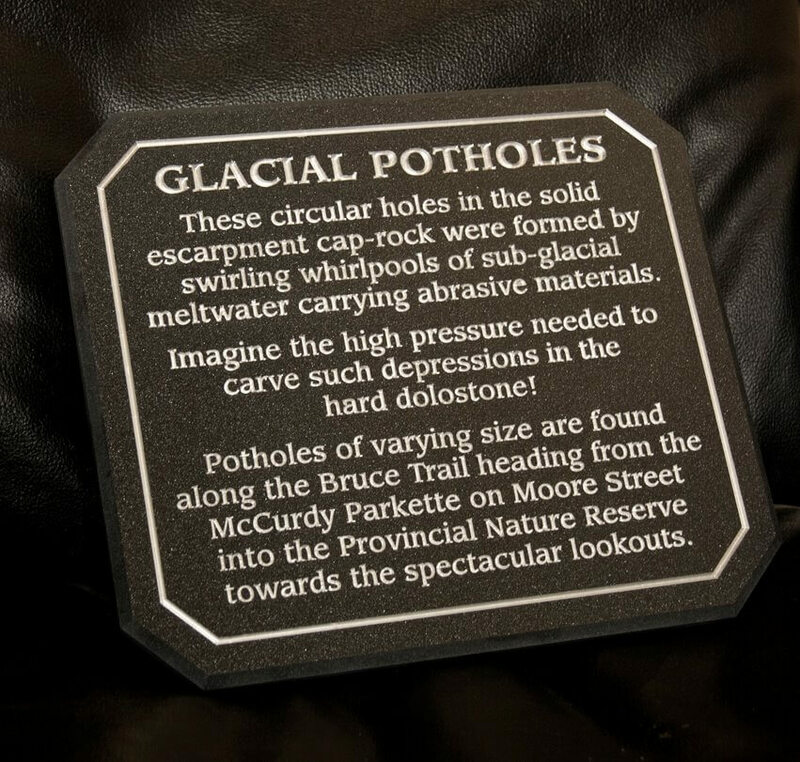 This plaque denotes a geographic feature near a local town. It is made from corian countertop material. 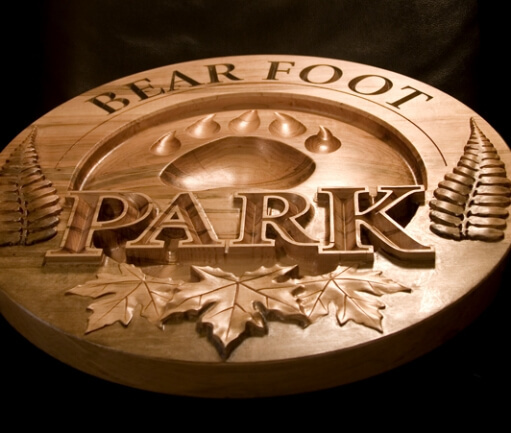 These signs were carved out of cedar for a campground. Bright colours and carving - you can't go wrong! 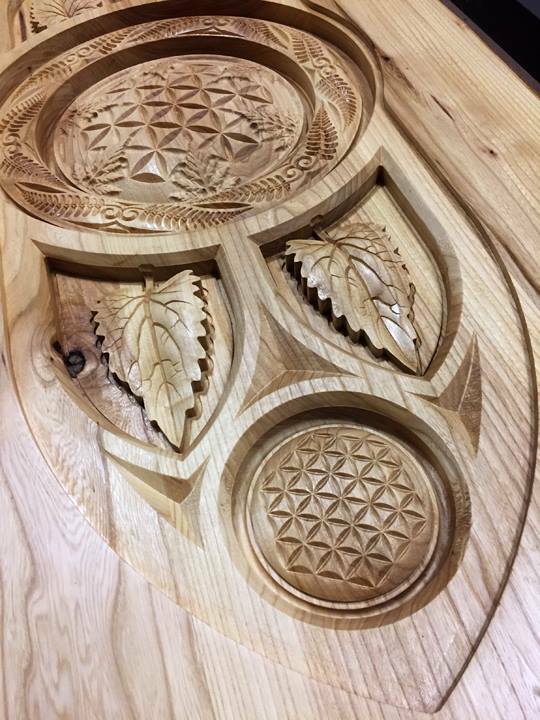 The details held up really well in the western red cedar. 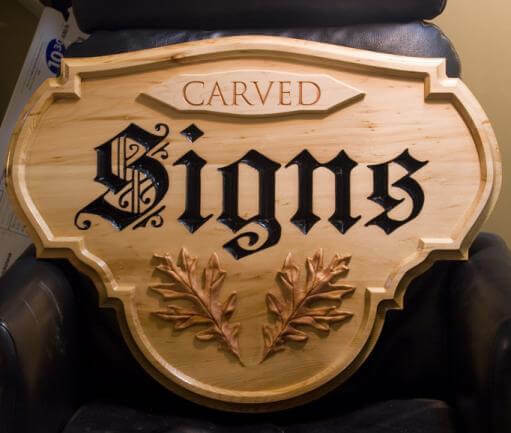 Carved cedar signs are very popular. 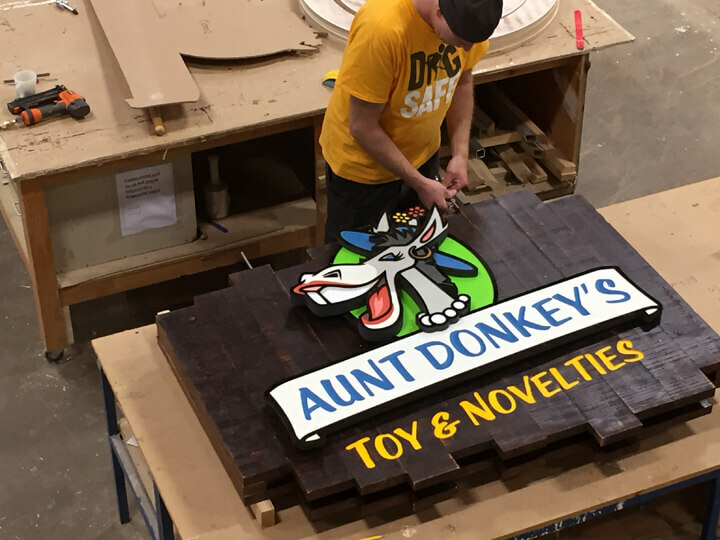 Aunt Donkey's? 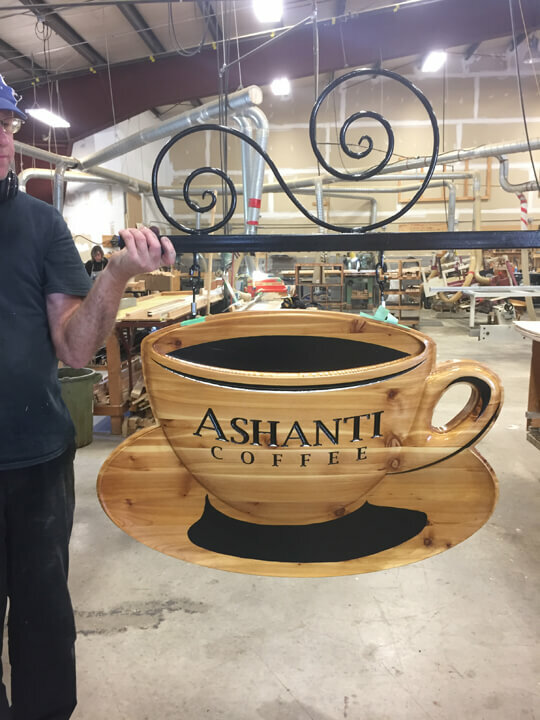 This crazy sign was fun to create from the client's logo. It has plenty of dimension! Some jobs are just fun. 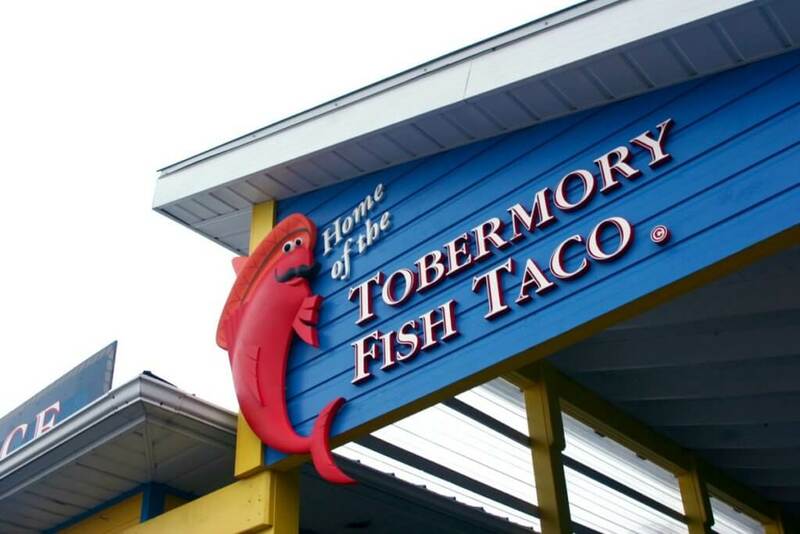 Creating a physical rendition of the cartoon 'fish taco' character brought a smile. We made a freestanding version as well! 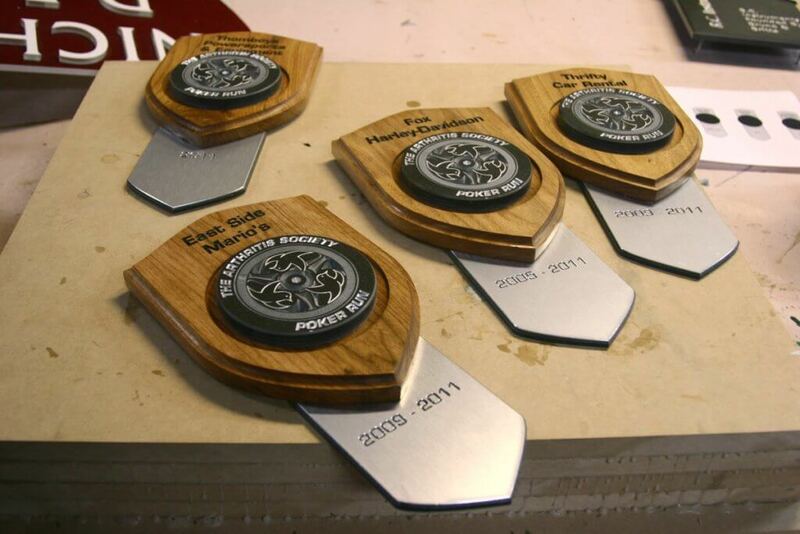 These custom plaques were presented to the arthritis society for a motorcycle fund raiser. 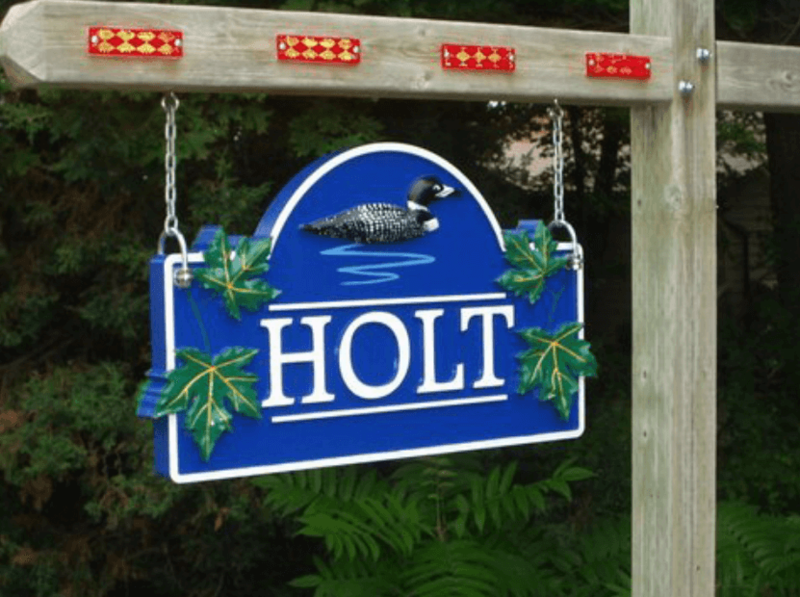 House signs are an expression of the home or cottage owner's pride. 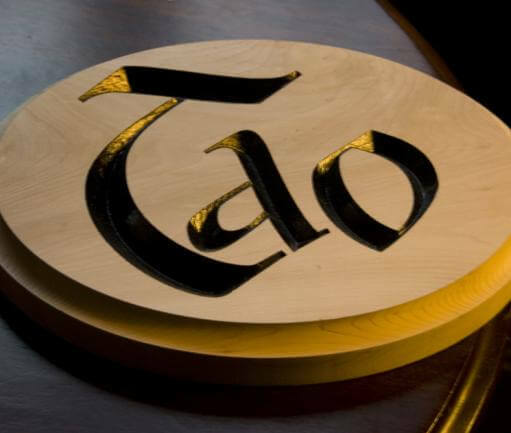 Often these signs are carved, sporting 3d emblems or even gold or copper gilding. 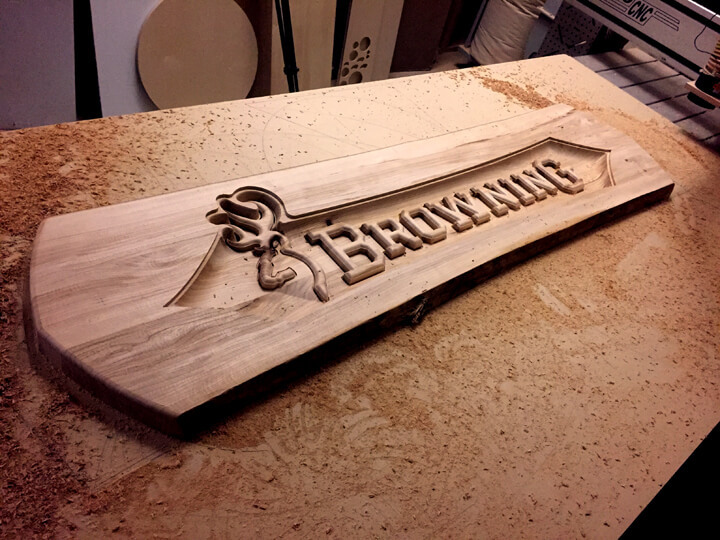 This interior sign was carved out of basswood. 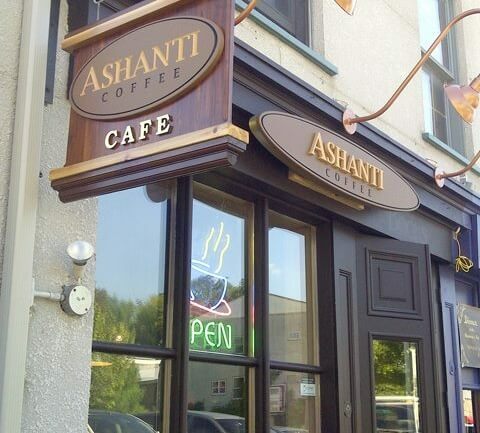 The design was inspired by the nick name of this gathering place! The leaves and footprint of this maple sign, whose grain looks like a sunset. 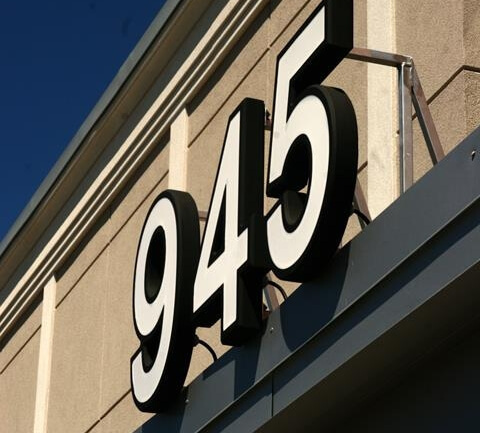 Address signs can be very attractive. 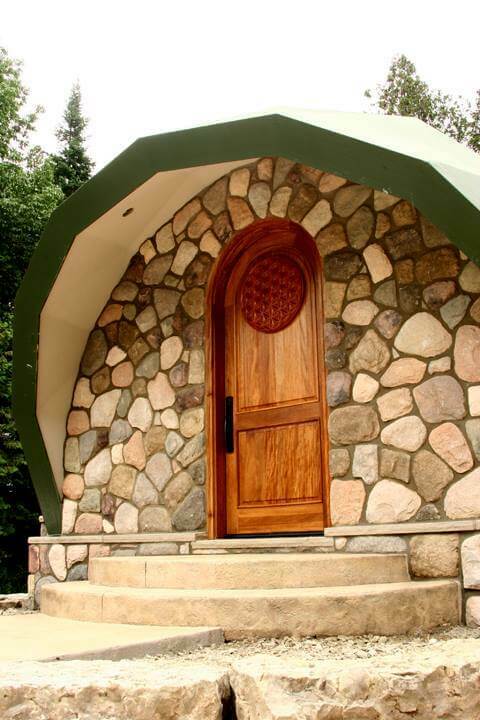 Carved High-density foam offers the beauty of form. 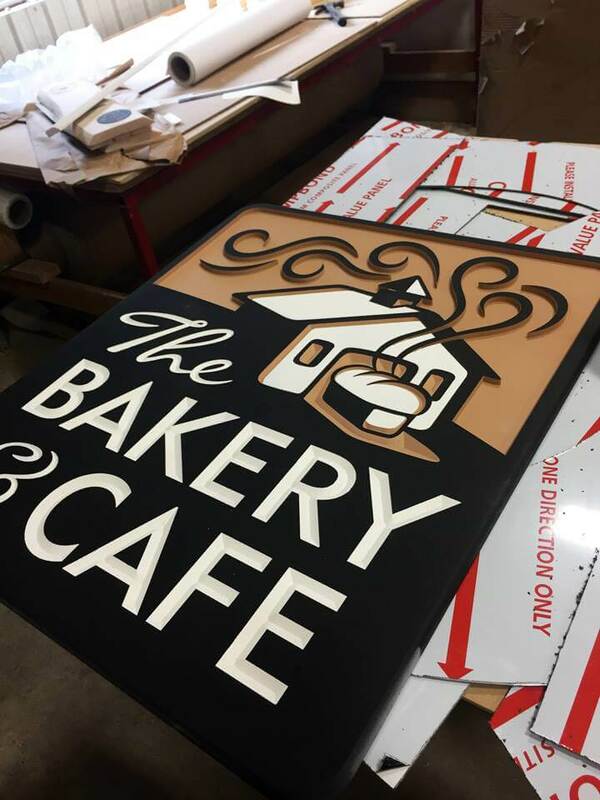 Airbrushing and copper guilding make this sign really unique! 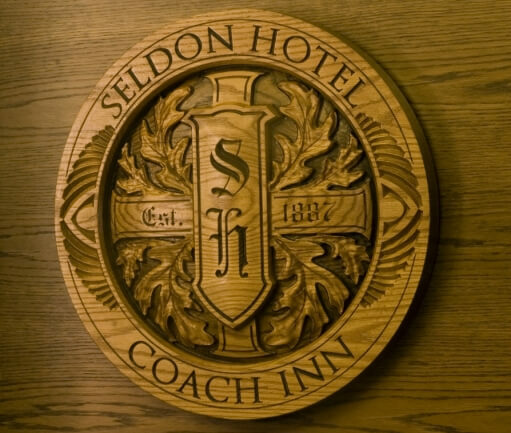 This oak carved sign commemorates a historic building. The stark contrast of black and white is very attractive in this instance. 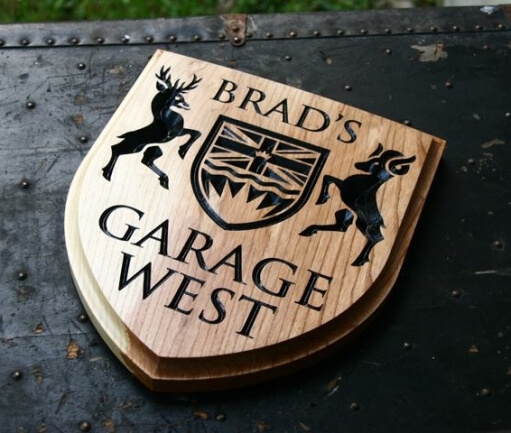 Guys ove their garage signs! 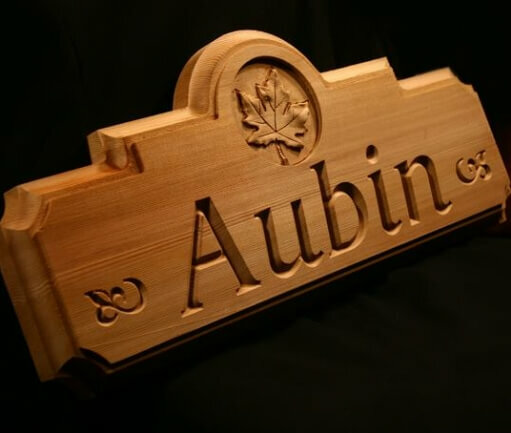 This carved house sign has a 3 dimensional leaf ornament. 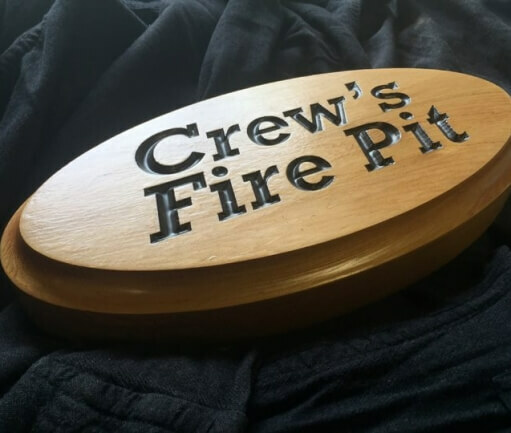 small cedar signs are popular around fire pits and hot tubs. 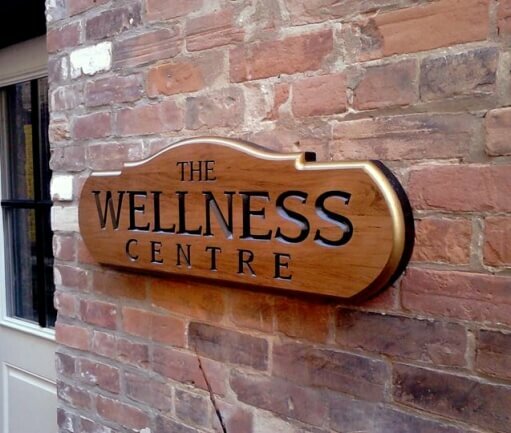 The gold leaf really makes this elegant sign. Deep carving adds lots of drama. 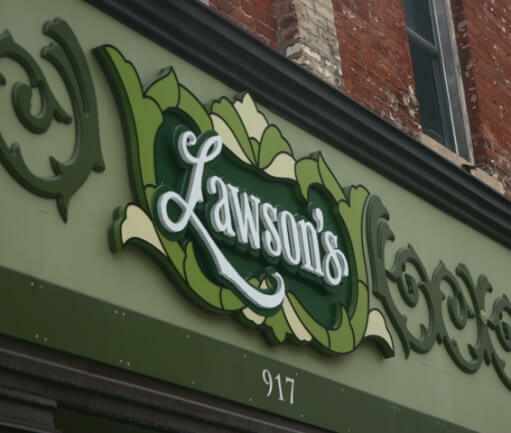 Old-style lettering is attractive on carved signs. 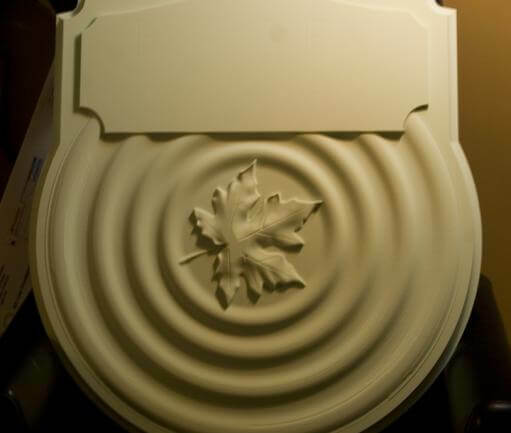 A close-up of the leaf carving. 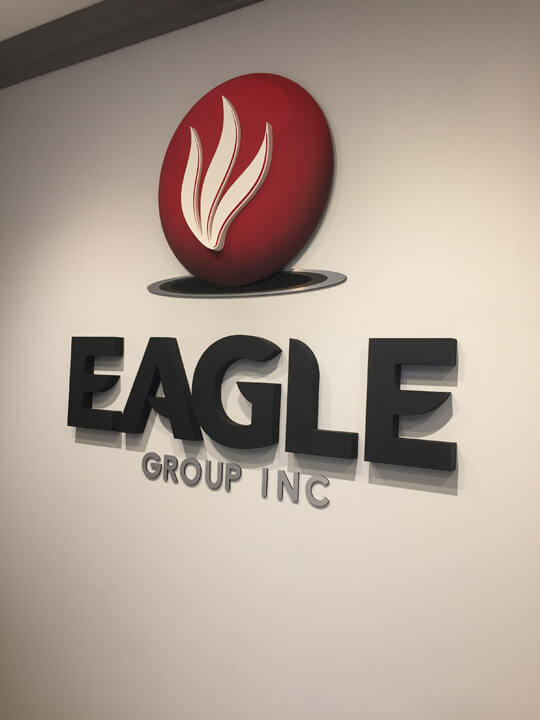 This client needed a logo design as well as a sign.. 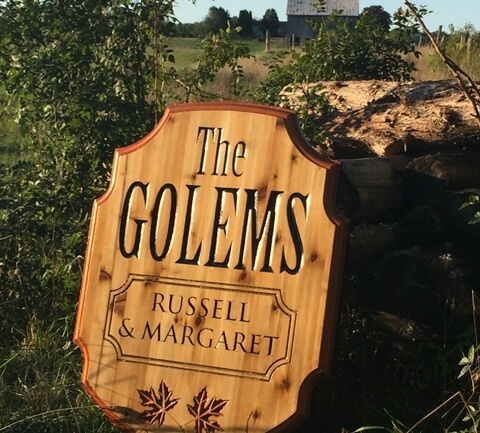 Simple cottage signs can be quite effective. Convex shapes can generate lots of interest. 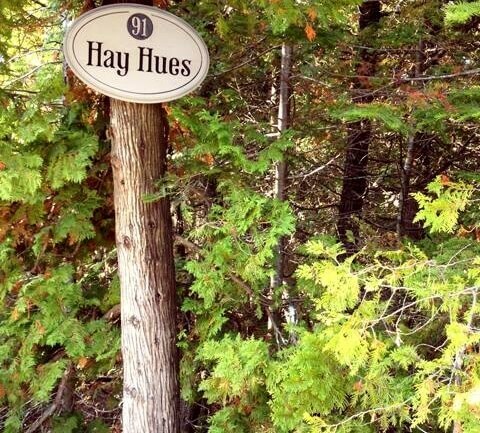 This cedar sign was created for the entrance to a trail. It will likely be allowed to age to a gray colour, without preservation, in keeping with the philosophy of the recipient. 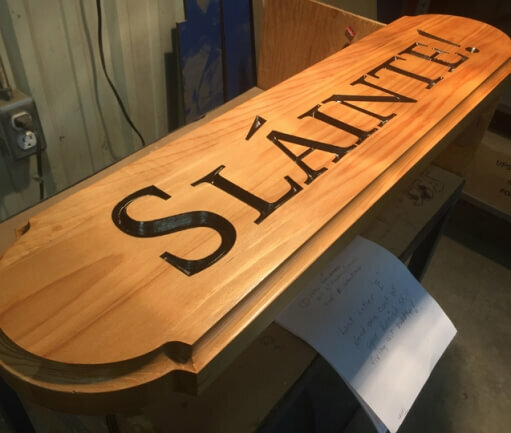 A wooden sign prior to finishing. 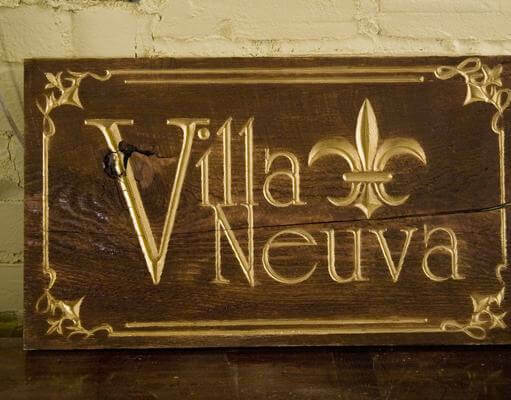 Villa Neuva This sign is carved into barn wood and painted. 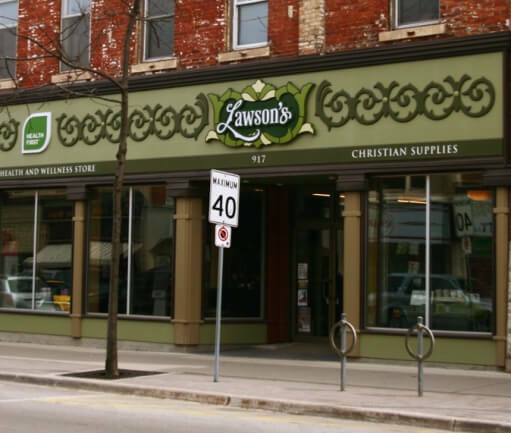 We offer architects and builders a reliable, scalable solution for elements to be installed in buildings. 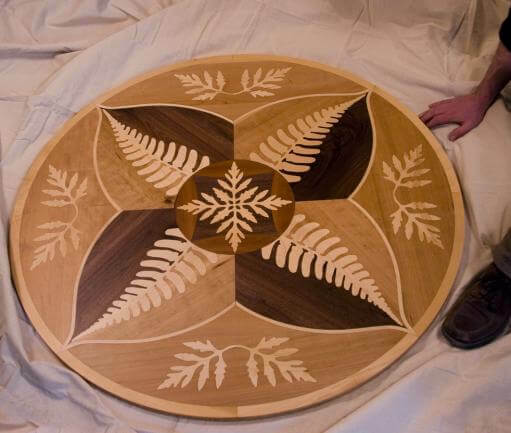 Fern Wood Medallion Inlay: This is the first of many designs created to be inset into existing or new wood floors. The wear layer is approx. 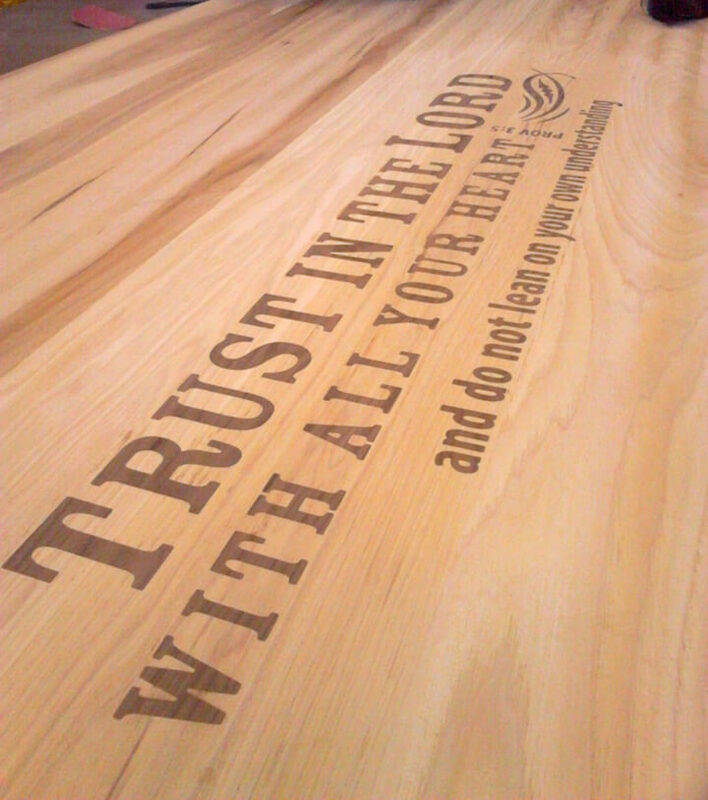 1/2" thick hardwood, laminated onto baltic birch plywood. This allows for refinishing and sanding of the floor for the life of the building. The total diameter is about 45". 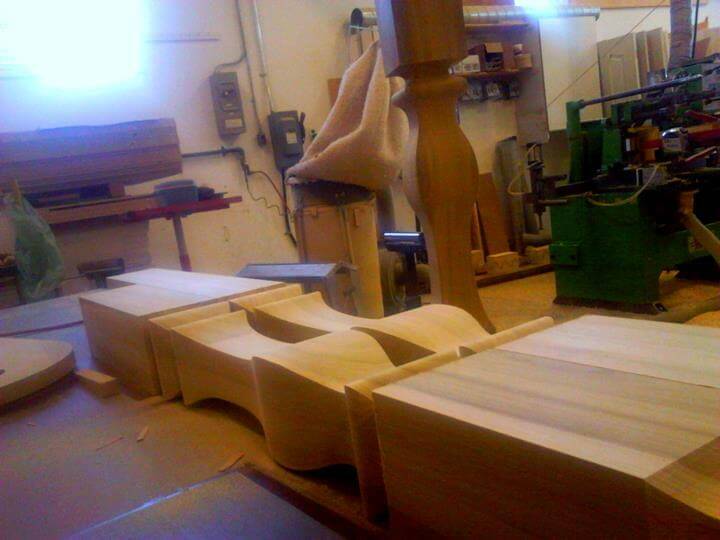 Woods used are 2 types of Cherry, Walnut, Maple and Birch. 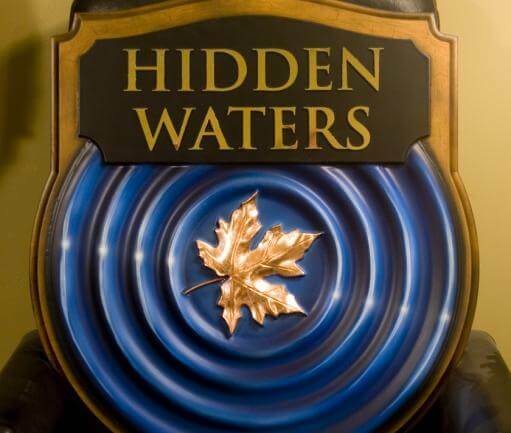 The designs will all focus on Niagara Escarpment flora and Fauna. The curved bottom step made this simple staircase so much more appealing. These stair stringers are 14' long. The pocket-and-wedge system of assembly eliminates the need for squeaky hardware. The pockets are produced from scanned cross-sections of treads for a seamless, tight fit with much tighter tolerances than conventional methods. 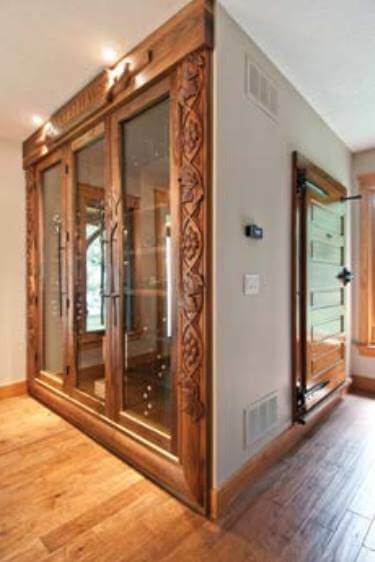 Custom walnut trim and a carved wine bottle across the top made this wine cabinet really spectacular! 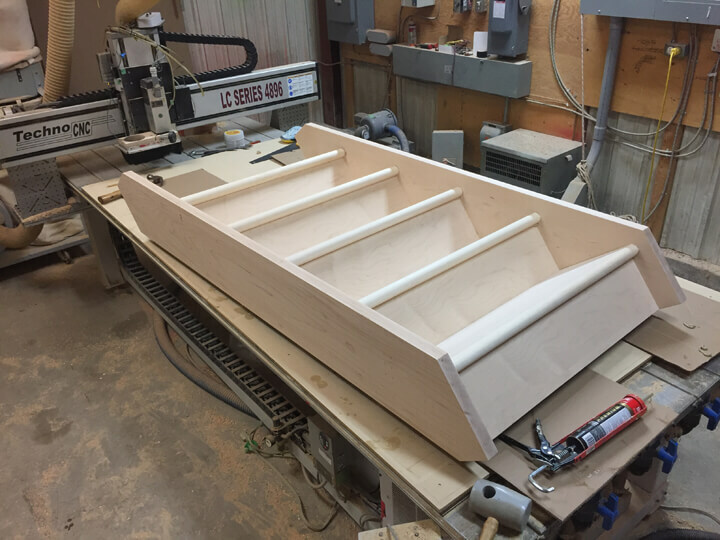 Even simple staircases, (pocketted together without squeaky fasteners) are both satisfying to work on and beautiful in their function. Glueing up massive slabs and accurately machining in the plumbing is very satisfying - such a rugged material can still be very precise! 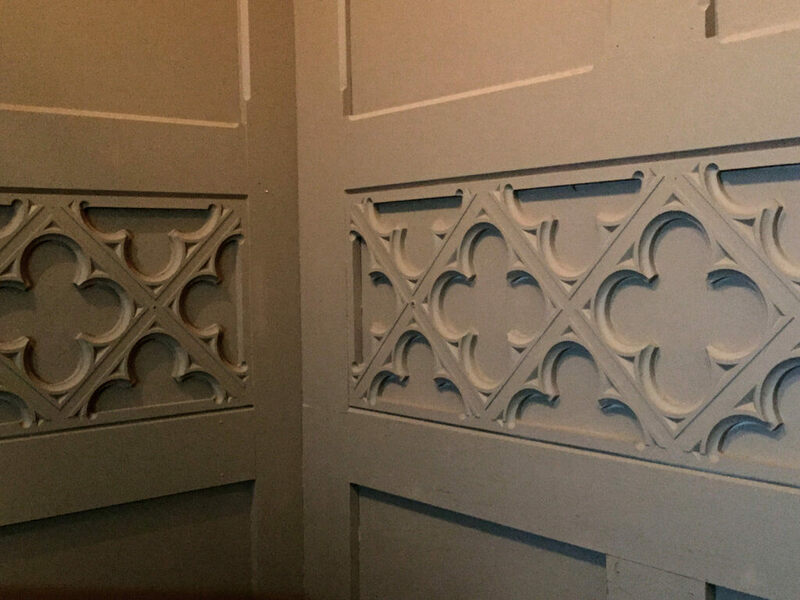 These doors were carved for a tall, narrow cabinet set into the wall. 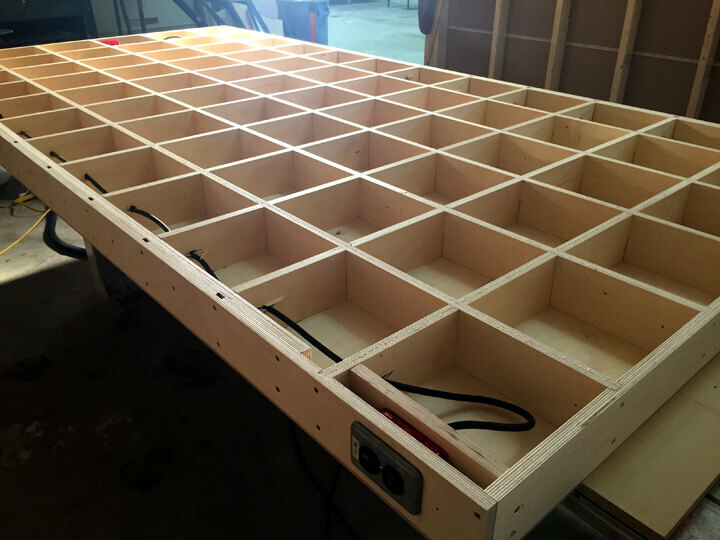 Torsion Box construction is used to create panels that are truly flat, by sandwiching a grid between flat 'skins' or panel. This one was used to build an excellent work table. 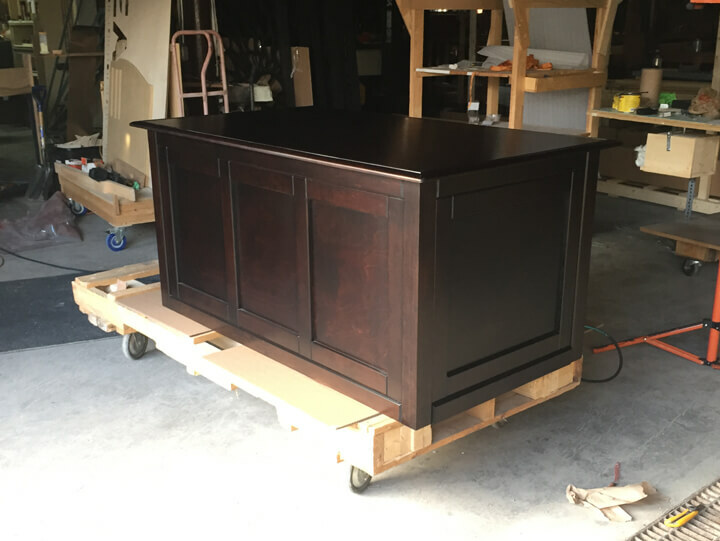 This custom cabinet was made to match existing furniture. It has sound dampening properties, as it houses a large magnetic resonance device that vibrates. 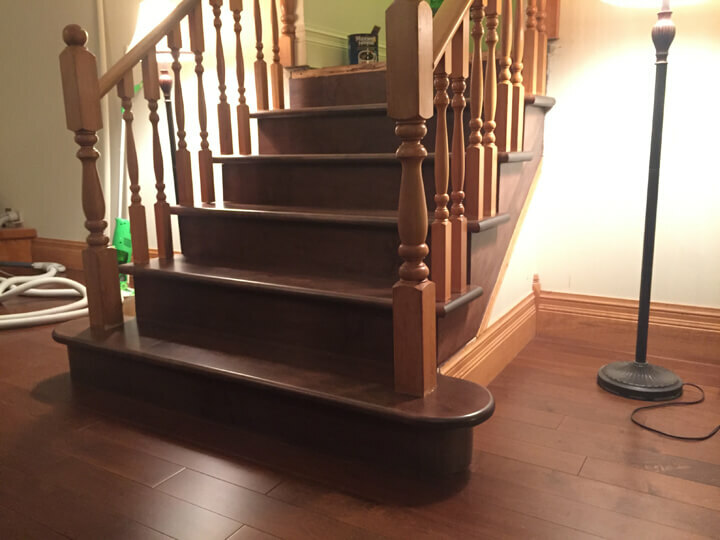 Dark finishes can be impressive when applied over our workmanship in birch and maple. 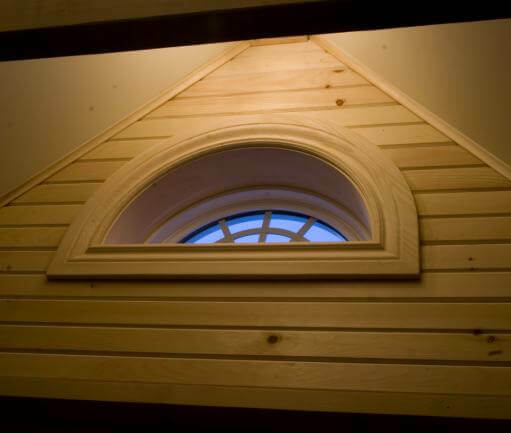 Custom Trim gives a regular opening a real 'wow' factor! 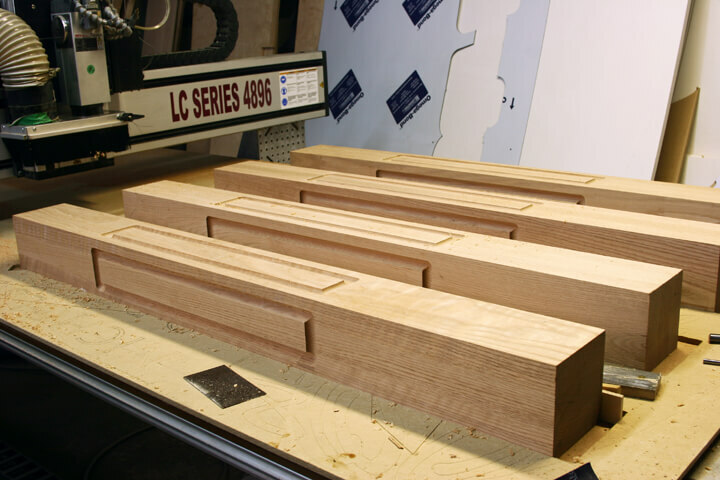 Custom trim panels for walls and coffered ceilings are well suited to our equipment and design capabilities. 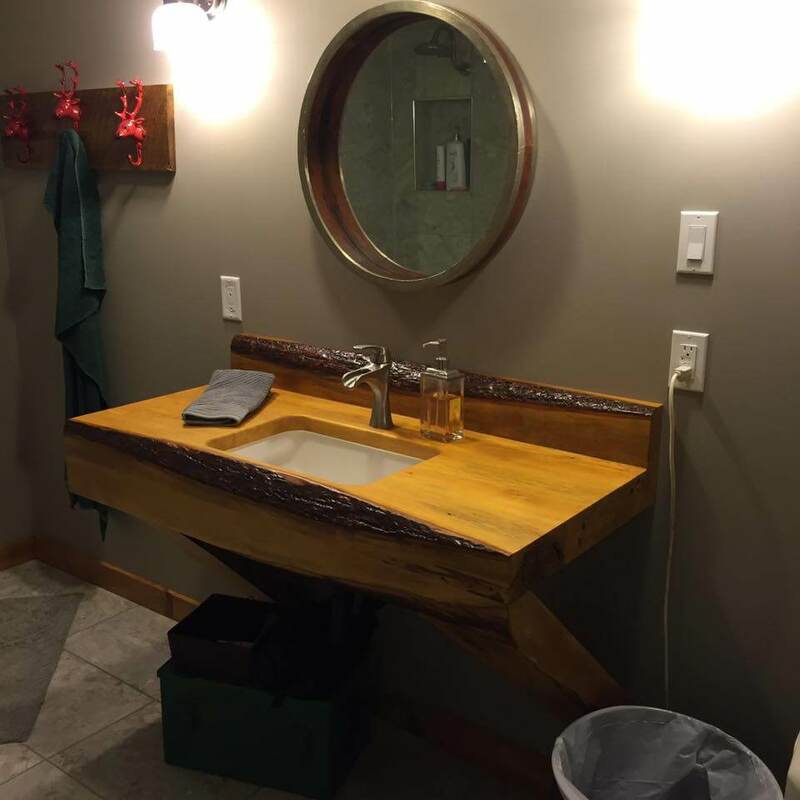 The client supplied a collection of wood pieces he'd been saving. We provided design. The result was simple and stunning! 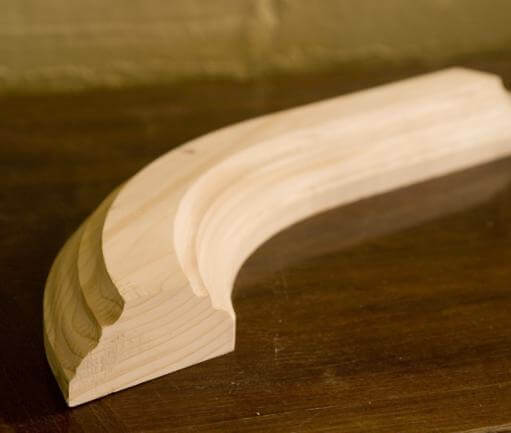 Curved Trim This trim was machined to replicate existing trim in an older home. 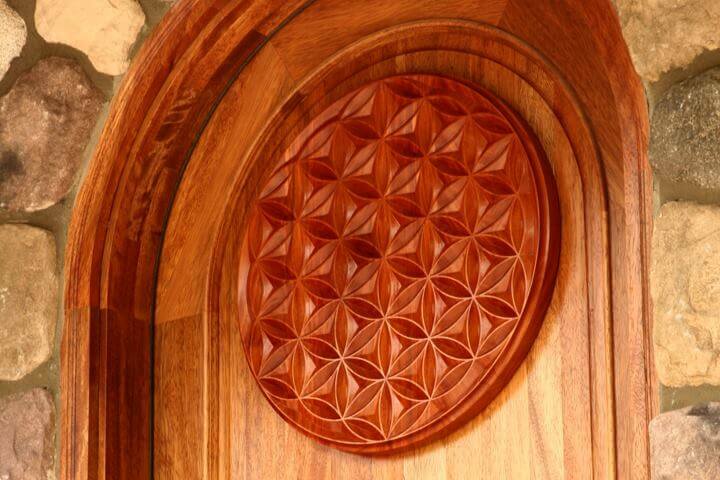 The flower of life graces the entrance to this meditation studio. We carved it from African mahogany. 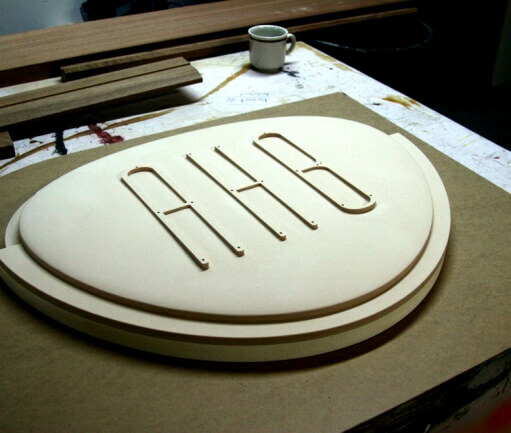 The round, carved symbol fits well with the arched door we made it for. 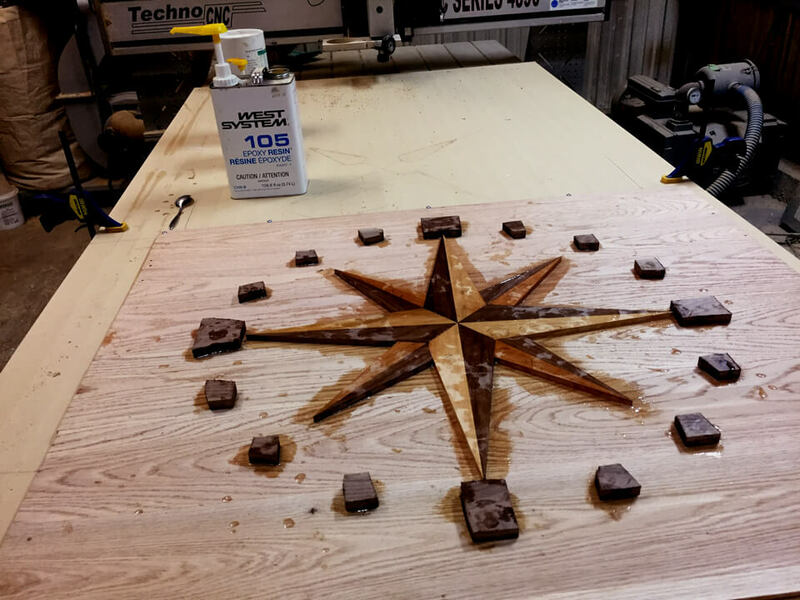 The glue-up of a compass star. 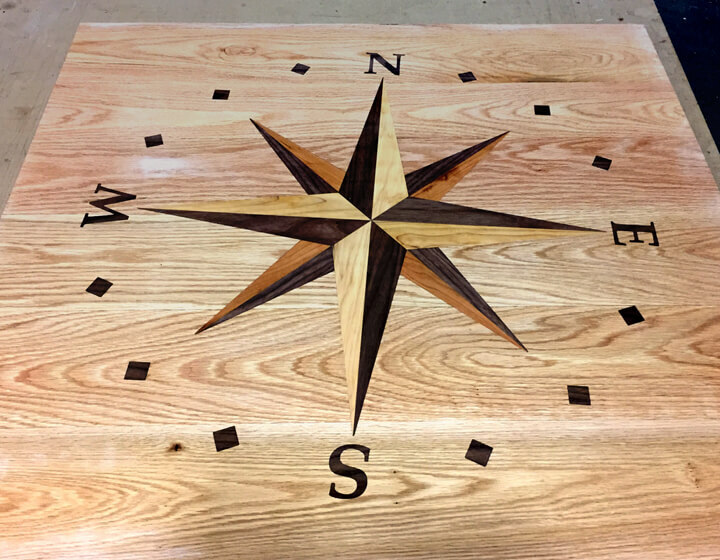 This compass star inlay was used as the landing of a staircase. The points of the star correspond with the direction that the house faces. 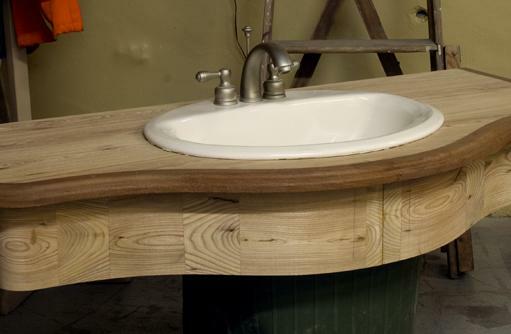 Bathroom Floating Vanity: This was designed to mount onto brackets, so that it "floats" off of the wall. Without a pedestal the room feels larger, as the floor continues beneath it. 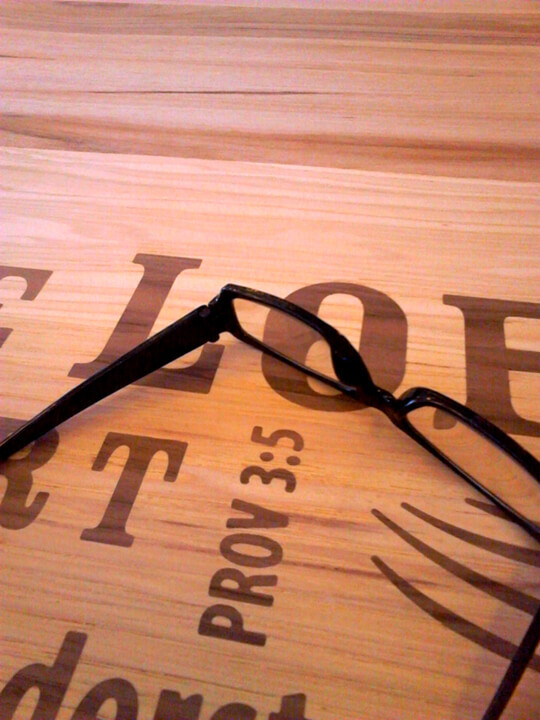 The woods used are elm and mahogany. The finishing had not taken place at the time of this photograph. 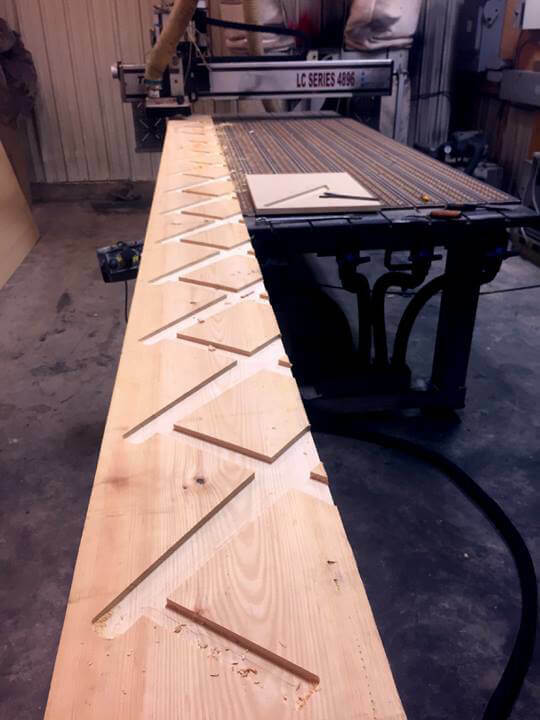 Corian Countertop Inlay: A series of pieces of Corian (countertop material for kitchens and bathrooms) were cut to form this design, and glued together. The green part of it is translucent, and can be backlit. 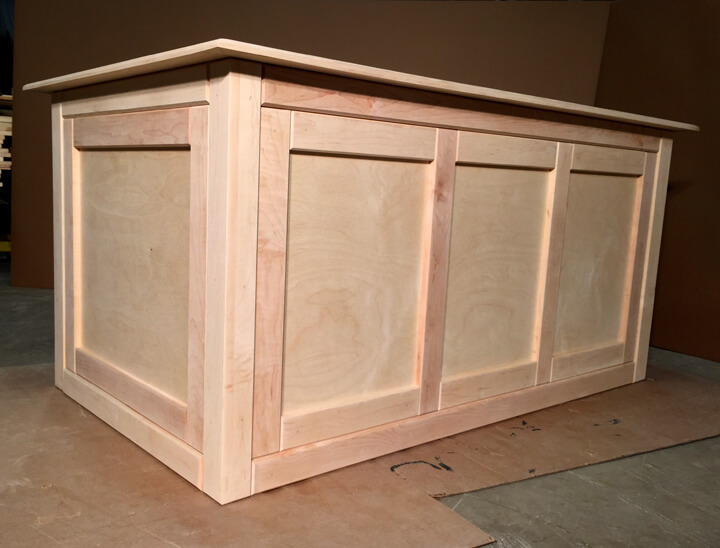 This would be great as a counter where the till is located at a business, using the business logo as artwor, or set into a bar top. This mdf door matches the profile of the other existing doors. 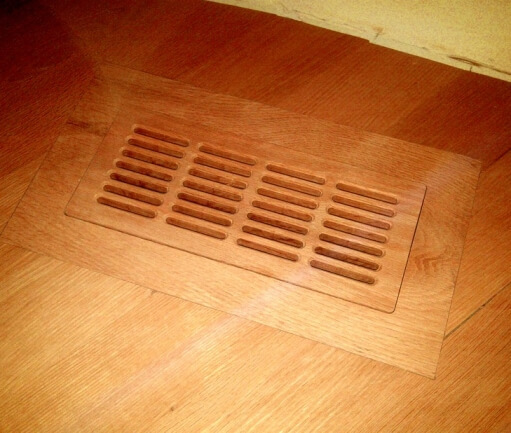 Custom Floor Heat Grates can be produced in various unique ways. Contact Grant for a Quote Now!